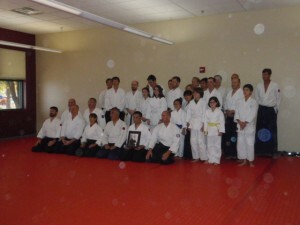 Kiryu Aikido has been awarded the Best of Lone Tree Award in the Martial Arts Activities category. Presented by the Lone Tree Award Program, the award recognizes local businesses for their success in the community and within their category. 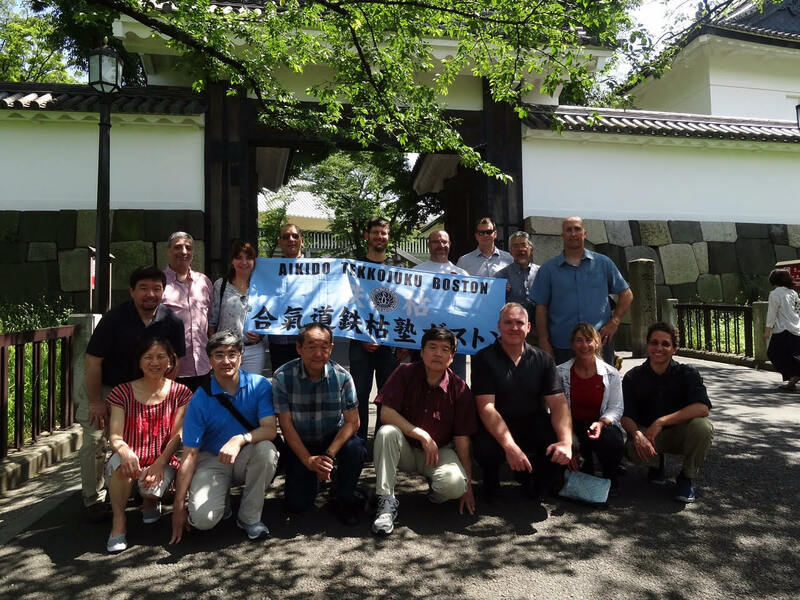 Kiryu Aikido was recognized for our use of best practices and programs that enhance the positive image of small business through service to their customers and our community. As one of the Best of Lone Tree Award winners, Kiryu Aikido helps make the Lone Tree area a great place to live, work and play. 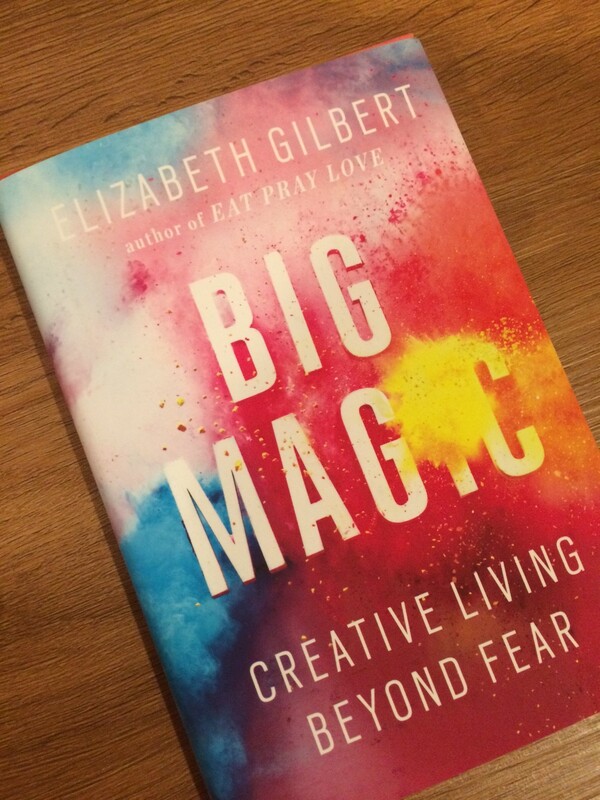 While the newest book from the author of “Eat Pray Love” is about creativity—recognizing it, welcoming it, and then buckling down to do the work necessary to bring it into a tangible form—I believe much of the book’s explorations relate directly to the practice of Aikido. Here’s just one passage to consider, which in my mind resonates in the same space as the secret technique of learning Aikido that Andrew Sensei shares with every student: Get through the dojo door and bow in to practice, day after day. Because with the simple act of practice and consistency, big changes can take place (which are not magic, but can be magical). Without the simple act, very little can. Interesting outcomes, after all, are just awful outcomes with the volume of drama turned way down. I think a lot of people quit pursuing creative lives because they’re scared of the word “interesting.” My favorite meditation teacher, Pema Chodron, once said that the biggest problem she sees with people’s meditation practice is that they quit just when things are starting to get interesting. 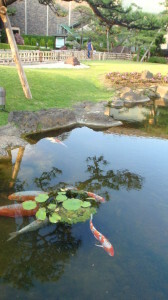 Which is to say, they quit as soon as things aren’t easy anymore, as soon as it gets painful, or boring, or agitating. They quit as soon as they see something in their minds that scares them or hurts them. So they miss the good part, the wild part, the transformative part—the part when you push past the difficulty and enter into some raw new unexplored universe within yourself. Don’t let go of your courage the moment things stop being easy or rewarding. That’s the moment when “interesting” begins. Andrew Blevins Sensei, Les Steveson, and Kara Stewart were honored to be part of the demo by Itoh Sensei’s AikidoTekkojuku Dojo from Boston. Blevins Sensei was also a nage and threw three ukes. Thanks again to Itoh Sensei, Joji Sensei, and all the students at Tekkojuku. 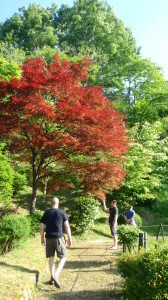 After Doshu’s morning class, we went back to the hotel and dropped our heavy gi bags and changed clothes for an afternoon of sightseeing. 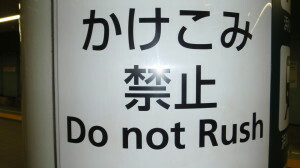 In one of the stations, we saw this sign for Hombu. It was beautifully timed, since we’d been training there the past couple days and took part in the 53rd All Japan Aikido Demonstration, which always ends on a spectacular note with the demonstration by Doshu. 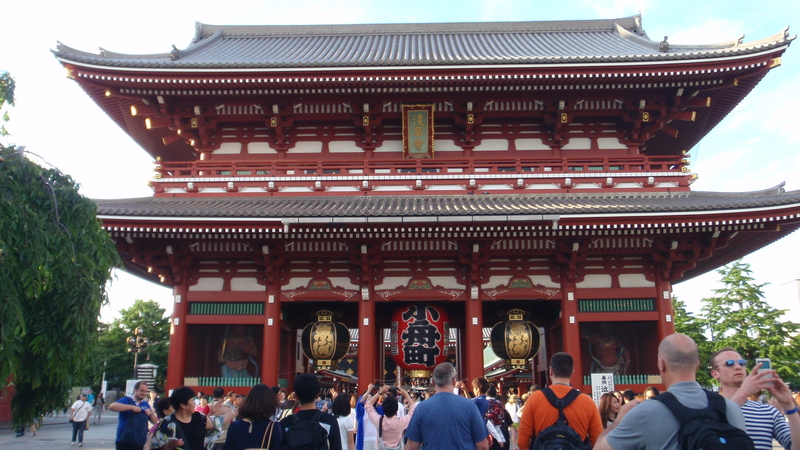 Feeling now oh so light and airy, we headed to Asakusa. On the way to the famous mon (gate) we stopped and got our fortunes by offering 100 Yen, shaking a very loud metal can with numbered sticks in it, and letting one stick fall out of the hole in the can. The number corresponded to one’s future prospects. Les-san’s was exemplary, mine was next best at “Excellent Fortune” (“getting success in life and wealth; you are real busy and prosperous”), and John-san’s was, well, not so good. 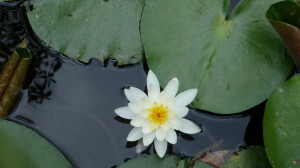 Over the next few days, he did all he could to increase his positive energy and get a more encouraging fortune. Luckily, he was later successful. Whew. We did a little shopping in Asakusa and had a late lunch. 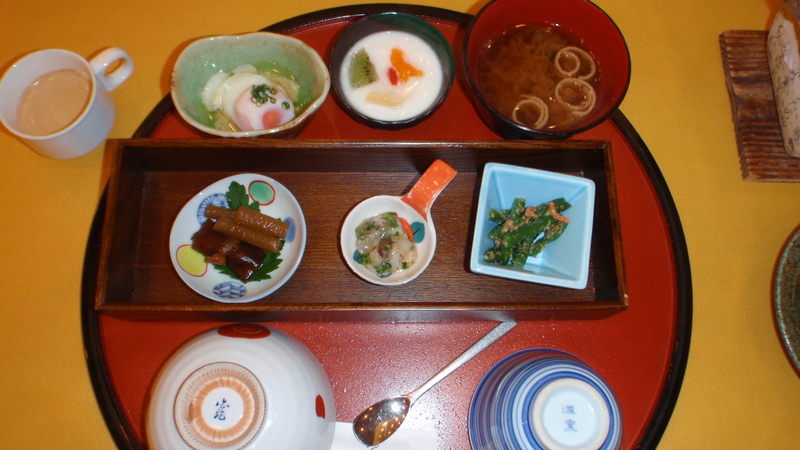 Mine: soba (buckwheat) noodles with dipping sauce. 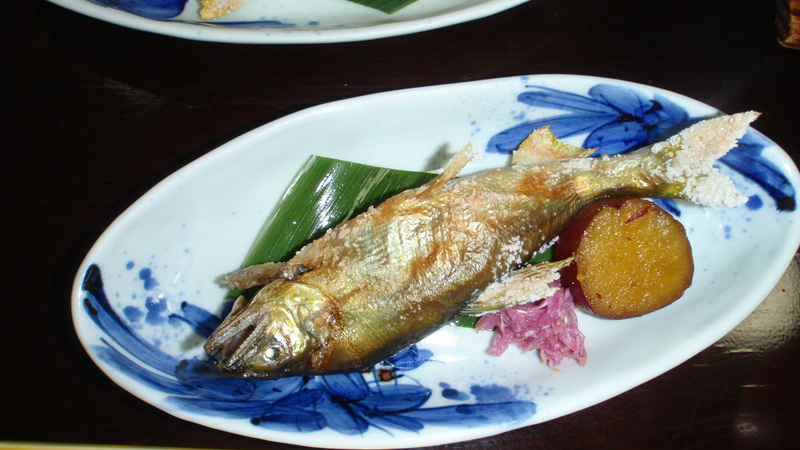 Mmmm, oishii up, as the new marketing phrase in Japan goes. Delicious Plus. 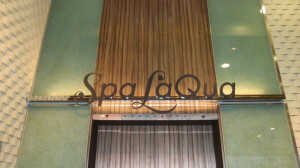 Next stop: Spa La Qua, a calm and restoring place right next to Tokyo Dome. After soaking for an hour and spending a little time in the relaxation area looking over the small amusement park below, we headed back to Shinagawa and had a late dinner at another izakaya. 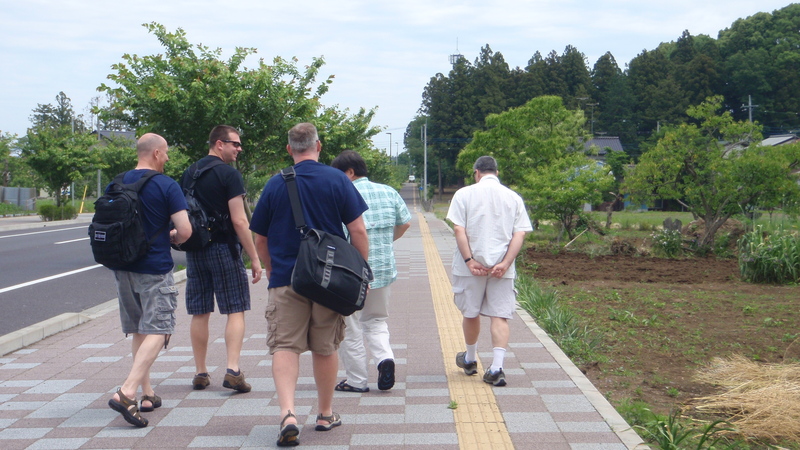 Today was a special trip: our group was going to visit Iwama with Itoh Sensei and his student, John-san. We arrived in Iwama around 11:30 after a two-hour train ride. Outside the train station, we paid our respects and took some photos at a statue of O-Sensei, which I don’t recall from my visit here in 2011. 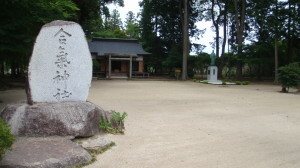 It set the stage and the mood for the half-mile or so walk to O-Sensei’s old dojo and historic grounds. 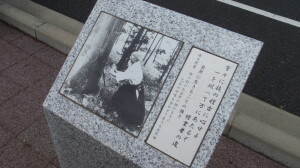 The sidewalk on the way to the dojo was flanked by granite monoliths, each with an historic photo of O-Sensei. One of our warmups in class is patterned after a kokyu exercise that O-Sensei did, which Les-san later demonstrated at a temple in Kyoto. Nearing the grounds, the Aiki Shrine beckoned us and we walked carefully over the gravel raked daily by the Uchi Deshi. 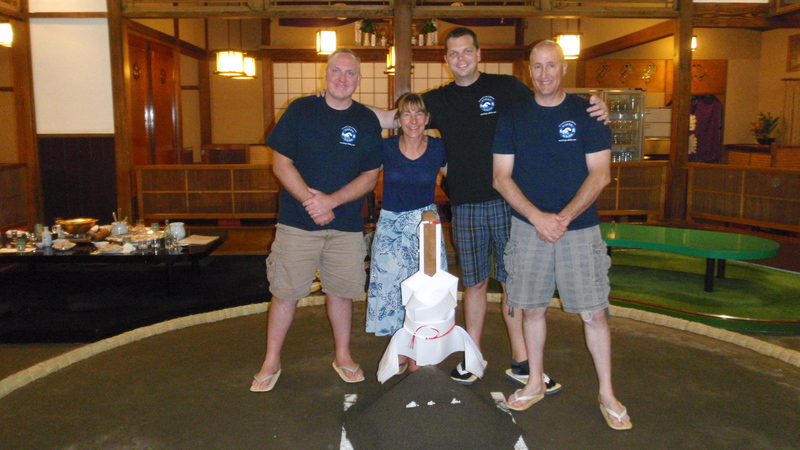 This was a special moment for all of us, as this is where our Aikido journeys began. For me, it was also a tribute to our teachers. 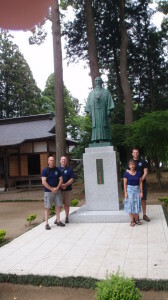 Without O-Sensei, we wouldn’t be here in Japan, practicing Aikido at Hombu and participating in global All Japan Aikido Demonstration. 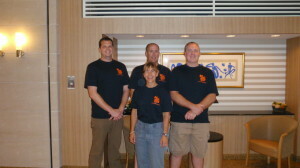 And without Blevins Sensei, our group wouldn’t have met, begun practicing Aikido, or be in Japan now, enjoying all these experiences together. He told us as we walked toward the shrine that it was very special moment for him: to be at Iwama with his students. He was Uchi Deshi under Saito Shihan many years ago, and his only regret is that he didn’t take a few photos then. He’s shared some great stories of that experience and I wonder if it feels like coming full circle in some ways, revisiting the grounds he once took care of, and now in the company of his students. On our way back to the Iwama station, we stopped for lunch at a little café and had some great home-cooked food. No doubt inspired by the place we were in, Blevins Sensei and Les-san did a little Aikido while waiting for the train back to Tokyo. 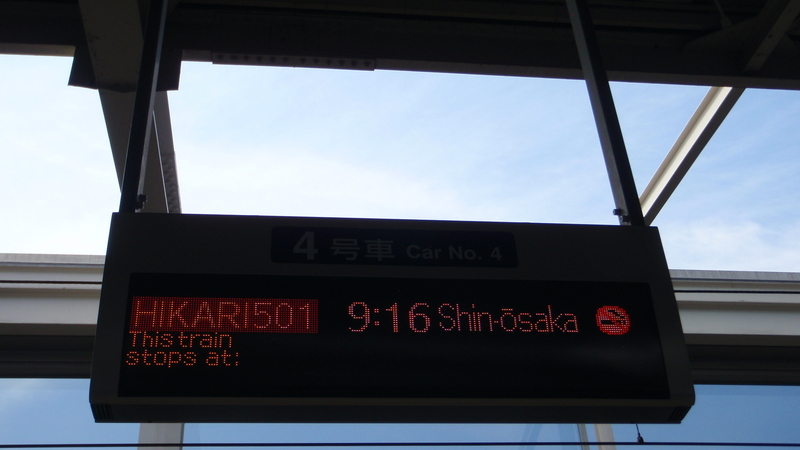 Mid-way back to Tokyo, our train stopped while the conductor was punching tickets. He paused, a momentary change came to his face, and he calmly yet quickly left the ticket punching and strode to the front of train. 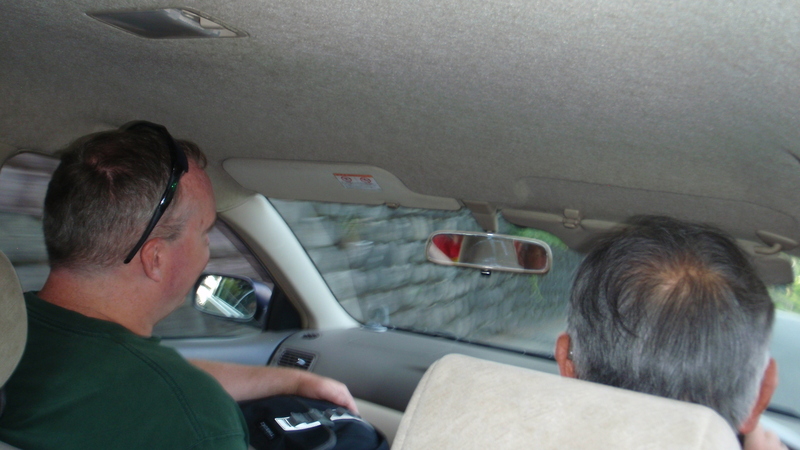 We sat a while before we heard the news of why we’d stopped: an earthquake. 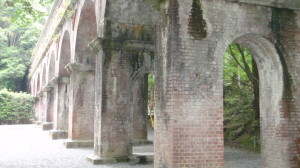 When the train got back running, we went very slowly along the tracks for several miles before picking up speed again. We learned later that it was a 5.0 quake – the strongest since Fukishima in 2011. Tonight’s dinner had us full of excitement. Joji Sensei had made us reservations at Yoshida, a former sumo stable and now chankonabe (sumo pot cooking) restaurant. 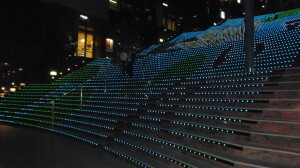 Before dinner, we had about 1.5 hours to walk around Akihabara – known as Electric Town. It’s as high-energy as its nickname, with otaku of many forms. Our table was one of four on the floor of what used to be training ring. 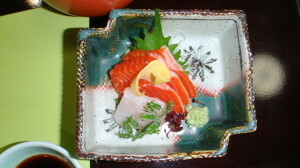 Other tables were filled with a large group of Japanese women and a group of business men. After our dinner started cooking, the emcee (a former sumo competitor) welcomed everyone and said, “We hope you enjoy tonight’s presentation, but unfortunately the gaijin seated at this table won’t understand a word,” as he waved his arm toward our group and everyone giggled. I understood enough Japanese to have gotten his joke, and Blevins Sensei of course understood all of it. We smiled and chuckled, too. 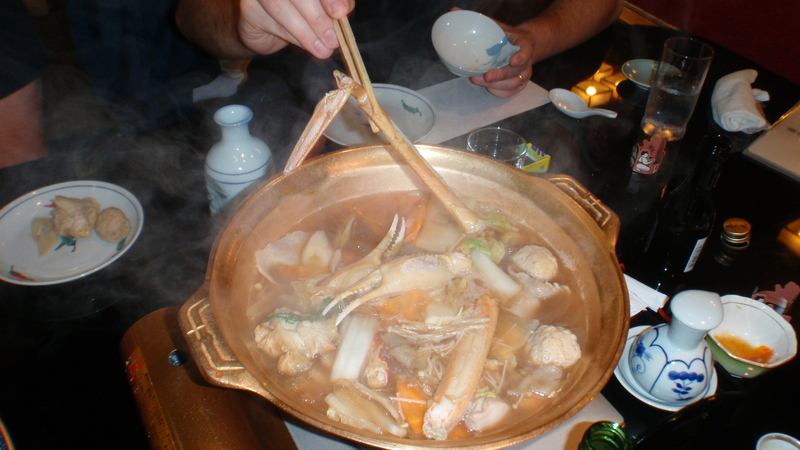 Like Shabu Shabu, chankonabe involved cooking a heaping platter of crab, shrimp, chicken, scallops, salmon, tofu, and vegetables in a simmering pot of liquid. We polished off everything but about 5 lonely onions. 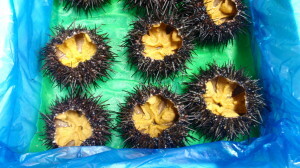 Oishii up! 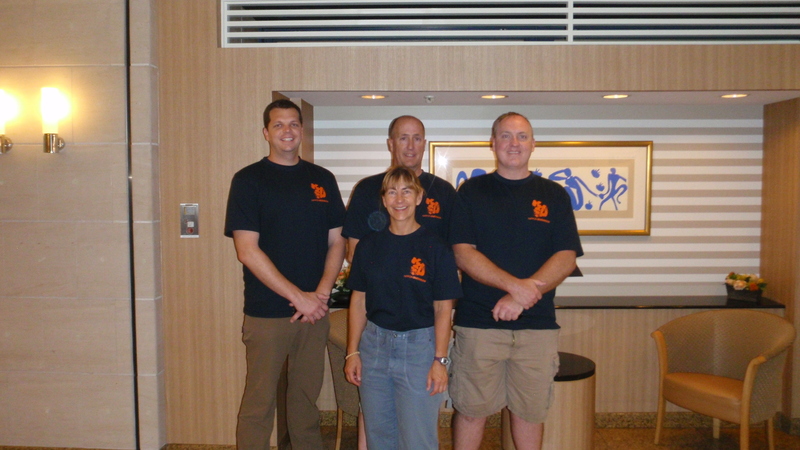 After we checked out of the hotel, we headed to the station to await our train for the next leg of our journey. 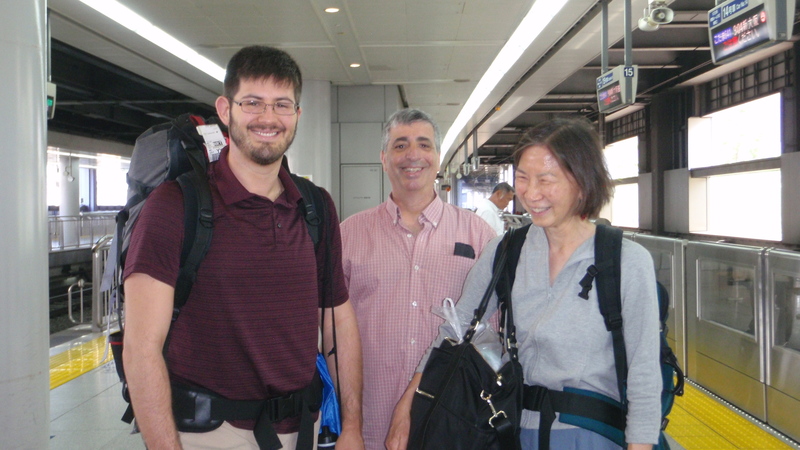 Priscilla-san, Ken-san, and John-san from Itoh Sensei’s group were on the platform and we wished them good travels. They were heading to Kyoto. 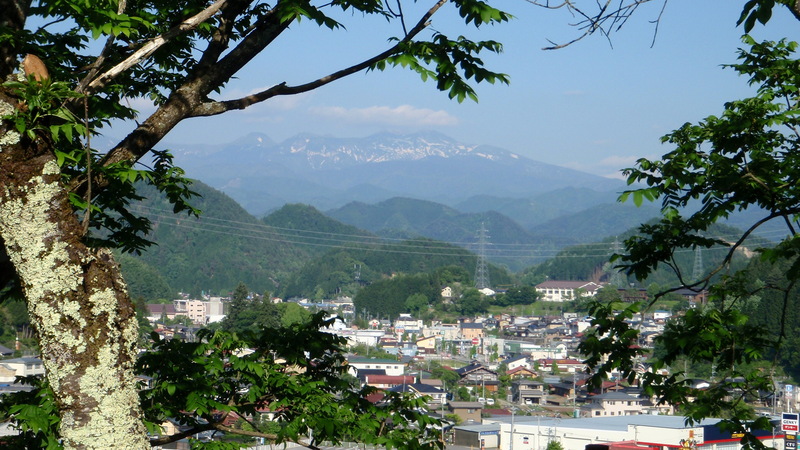 We would be traveling northwest on the Hikari (ひかり) train from Tokyo to the little mountain town of Takayama by way of Nagoya. 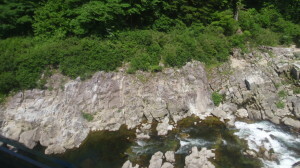 After a two-hour ride to Nagoya, we changed trains to the Hida Wide View line. I think the name came from the huge windows on both sides of the train, which really helped take in the views up the mountain canyons as we headed toward Takayama, skirting a river much of the way. We arrived at the charming Takayama station, and I was honestly surprised by how many non-Japanese there were in the station. 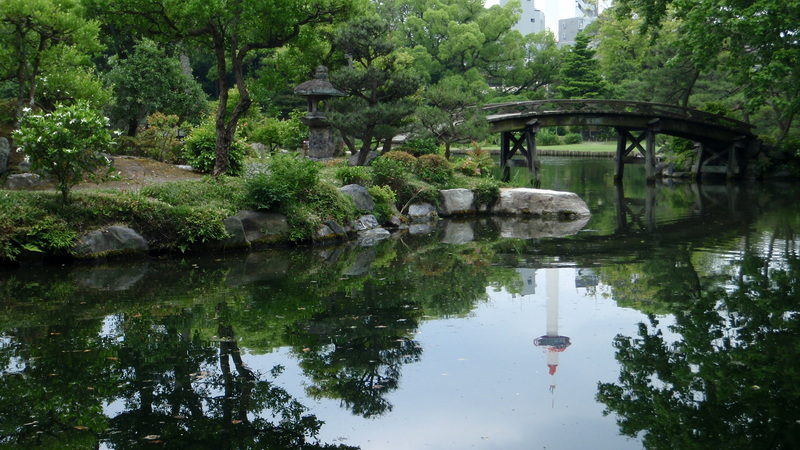 In Tokyo, it seemed our Aikido groups were often the only foreigners in many places. Here, in this small town, were Americans, Australians, Europeans, and other nationalities. 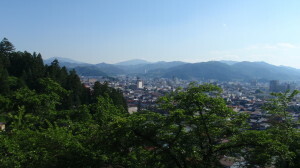 A few minutes after Blevins Sensei called the hotel, the shuttle bus arrived and took us up, up, up the side of the mountain to the Hagi Takayama Kanko Hotel, perched on the side of the mountain overlooking the valley where Takayama nestled. What a view, what a fantastic hotel. 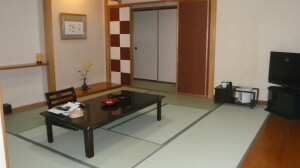 After the good-natured staff showed us to our lovely and huge tatami rooms – one room could have easily fit all of us – we headed out for a short walk before dinner. Several trails were accessible from the hotel, and the one we took meandered out to a gazebo that overlooked town and a range of high mountains. 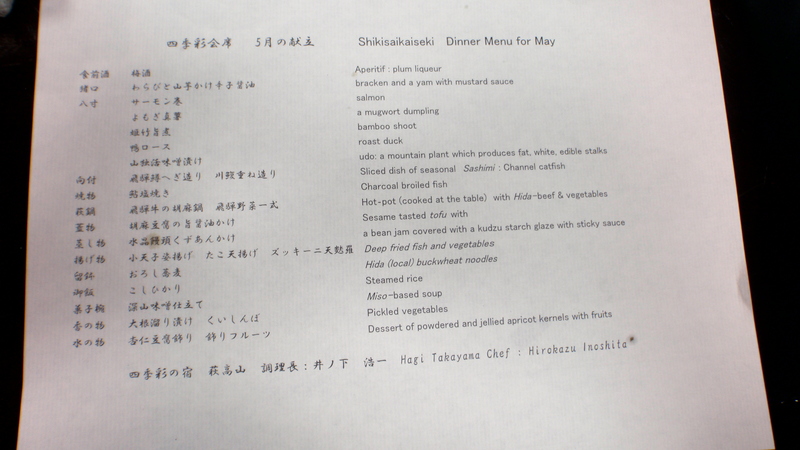 For dinner, we had reserved the multi-course Kaiseki Dinner featuring many local ingredients and recipes. A visual and gastronomic feast, with varied items, tastes, textures. Everything was delicious, but for one thing. Well, the fish itself was oishii, but I could not bring myself to eat the head of the grilled fish, much to the chiding of my table mates. 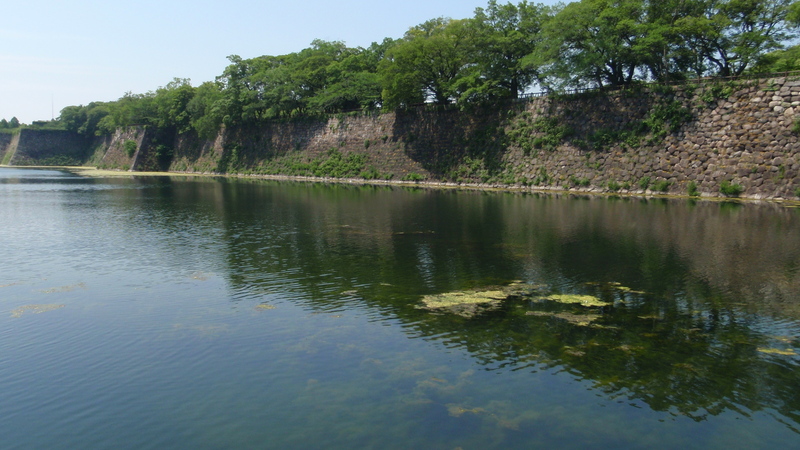 Next time…. 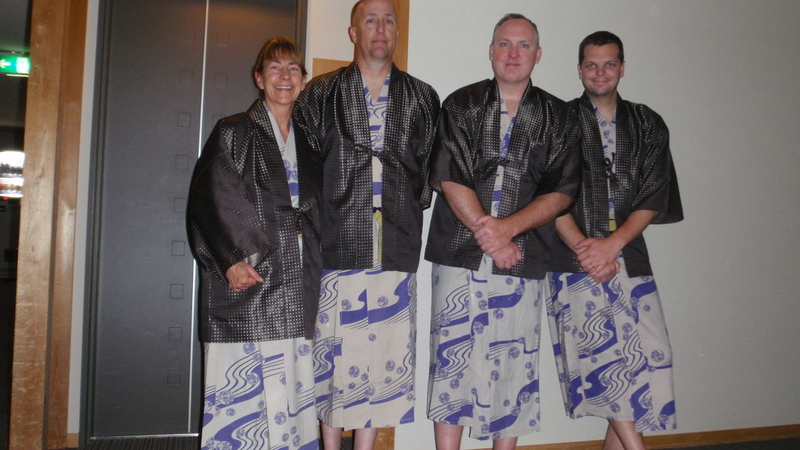 After dinner, we changed into our yukata and headed to the hotel onsen. 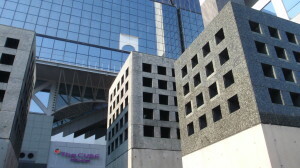 The men’s and women’s areas had indoor and outdoor pools, and the hotel also had several private pools that could be reserved. 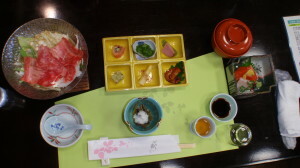 After our breakfast — as beautiful and varied as dinner had been the night before, with so many treasures in little compartments — we took the hotel shuttle into town. Our first stop was the morning market. Great little booths lined the street along the river, which was strewn with koi flags. 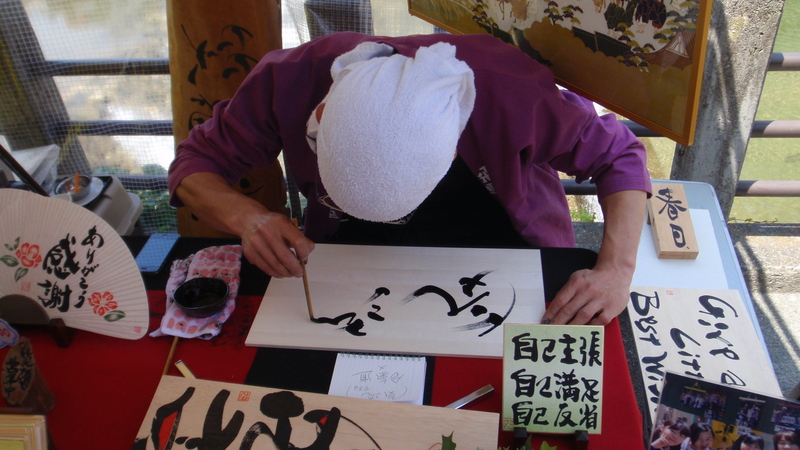 One of the best finds was a calligrapher. 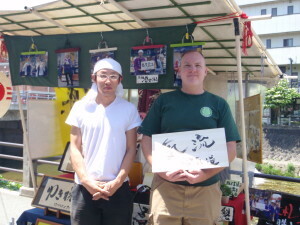 Les-san suggested getting a sign done with the dojo kanji for the California dojo, so we did. The calligrapher seemed very pleased it was for our dojo, and he wanted a photo of himself with the sign and Blevins Sensei to hang in his shop. I also found amazing blown glass sake glasses and a selection of fabrics for my Mom, the Master Quilter. 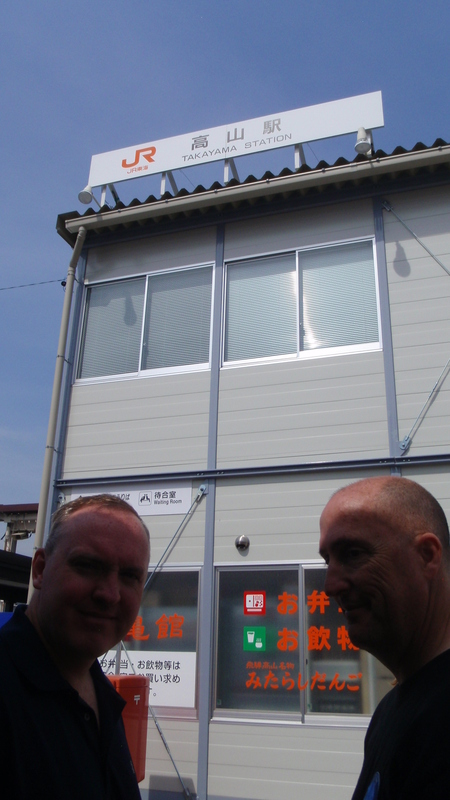 Next we toured the Ninja Museum, with artifacts from Ninja days gone by and rooms with suspended ceilings (the better to crush intruders with). Lunch was at a little shop to have another sampling of one of my favorite meals on the trip: sansai soba – buckwheat noodles with mountain vegetables. Oishii up! 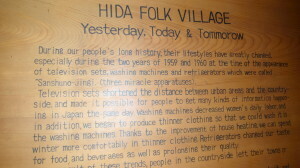 After lunch, our next stop was the Hida Folk Village, a collection of historic structures brought in from across Japan and restored there. 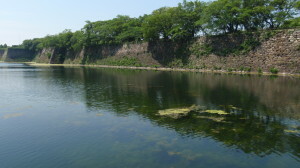 It was just on the other side of town, so we started walking… and walked some more, and then walked a bit more, and stopped for an iced coffee to restore our energy, and then walked some more. 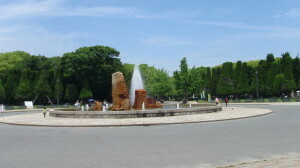 It seemed there was a Takayama Triangle in which map distance did not equal real distance, but finally we made it, and what a wonderful place. 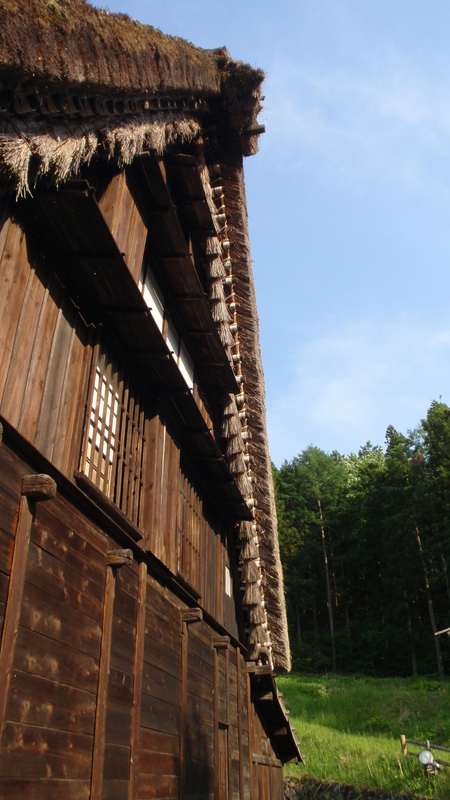 Most of the buildings were of the gassho-zukuri architecture, which means “prayer-hands construction,” with steeply pitched thatch roofs to fend off the heavy snows of the mountain regions. 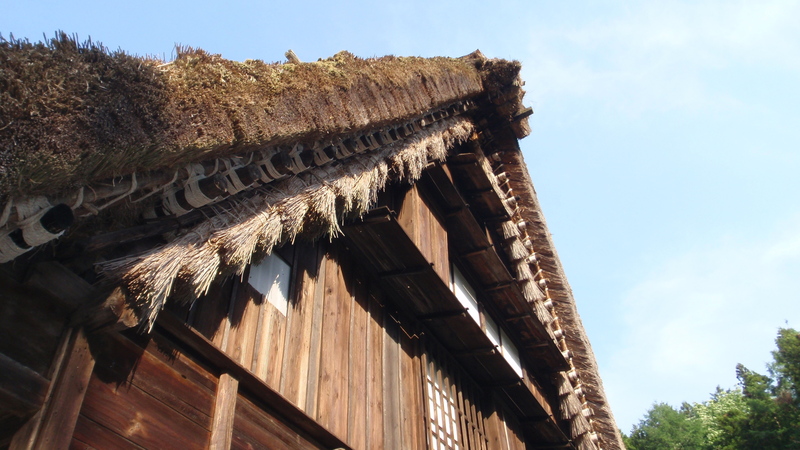 They didn’t use nails or joists in the roofing, but instead were fastened with ropes. Ingenious. When the village closed at 5:00, we made our way to the bus stop across the street to catch a ride back into town. Ah, but how silly we were to think this. The village closed at 5:00, but the last bus was at 4:49. It made perfect sense, haha. At least town was all downhill. 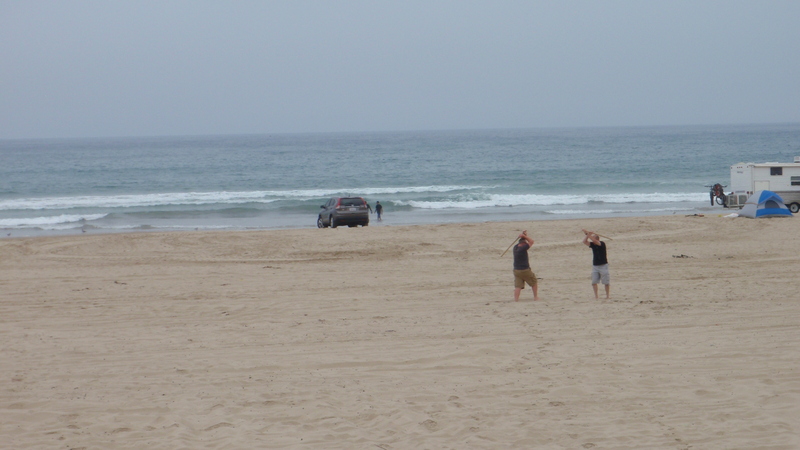 We started our trek back and watched a man back his sedan in a parking lot. All was well until we heard an ugly crash of metal hitting rock. 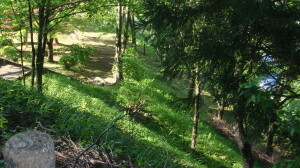 He’d backed his car into a deep stone-lined ditch and had gotten out to look at it. “Here’s our ride,” Blevins Sensei quietly said to me as we approached to see how we all could help. With several three-point turns and the aid of hand signals, the man was out of the ditch and poised at the parking lot exit. Blevins Sensei asked him a few questions, and he started clearing out the front seat so there would be room for all of us in his car. Here was our ride, indeed. He owned the tire store in town and was on his way home, which was just a block or two from the train station area where we were dropped off. We thanked him over and over, bowed deeply, and said goodnight. Just a few minutes later, as we were walking through downtown deciding on where to eat dinner that night, we saw him again outside his house. 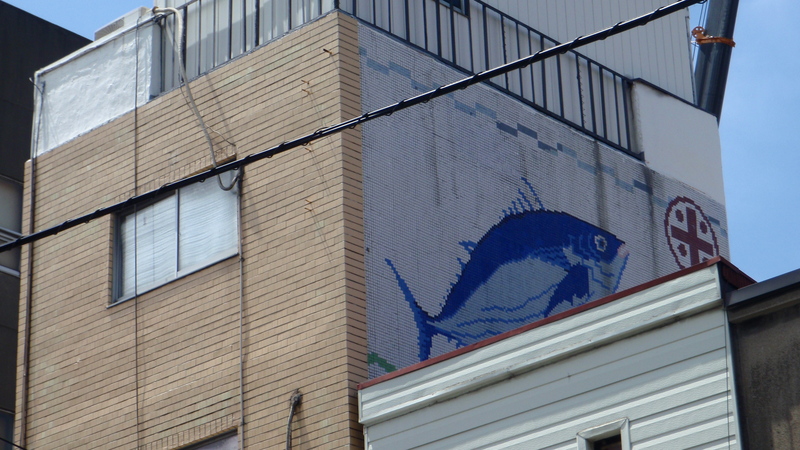 His face brightened as he saw us walking down the street. 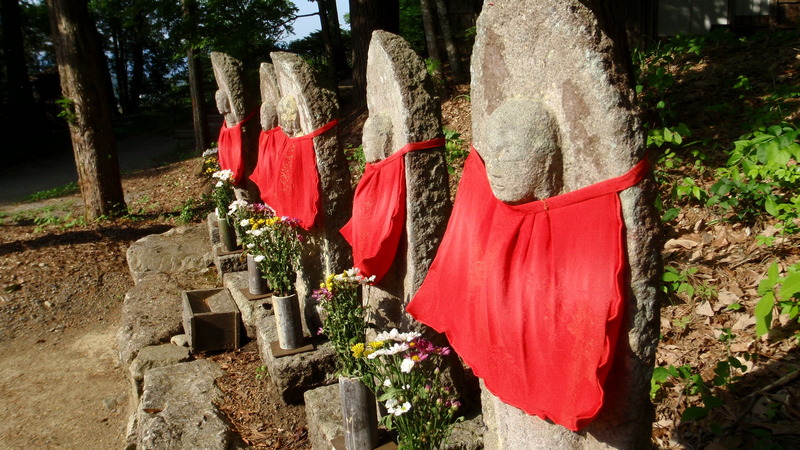 What a lovely non-coincidental experience it all was – a gift from the row of Jizo statues at the Hida Folk Village and other journey kami, I believe. 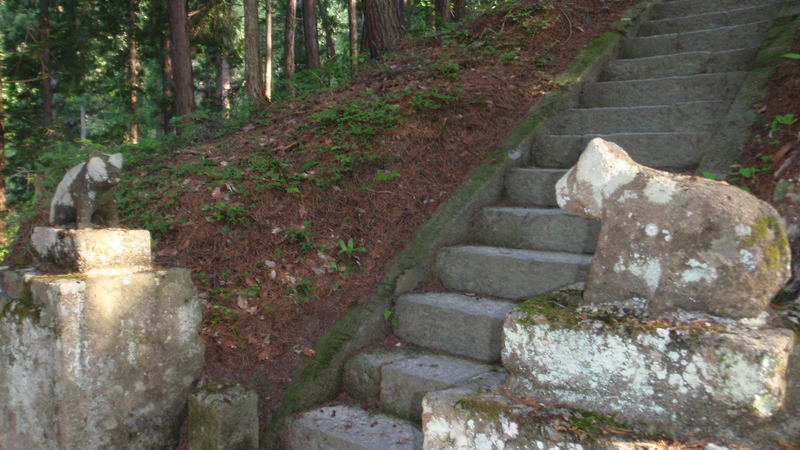 The town of Takayama once was named Hida, and to this day, its local Hida beef is renowned. Marbled, tender, tasty. We’d had a bit of Hida beef the night before with our Kaiseki Dinner, and we wanted more. 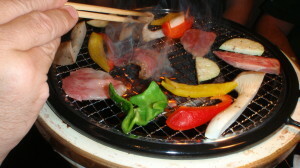 A hibachi restaurant fulfilled our craving with three cuts of Hida beef, and just a couple vegetables as a side attraction to the delicious grilled meat. 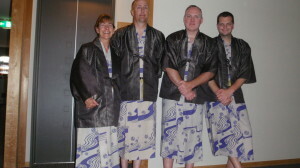 We took a cab up the hill to the hotel and wrapped up a wonderful day with a soak in the onsen and a gathering in John-san’s room to watch Japanese TV and talk. After another multi-course breakfast at our Takayama hotel, we checked out and took the shuttle back to the train station to await our train that would take us back to Nagoya and then on to Kyoto. 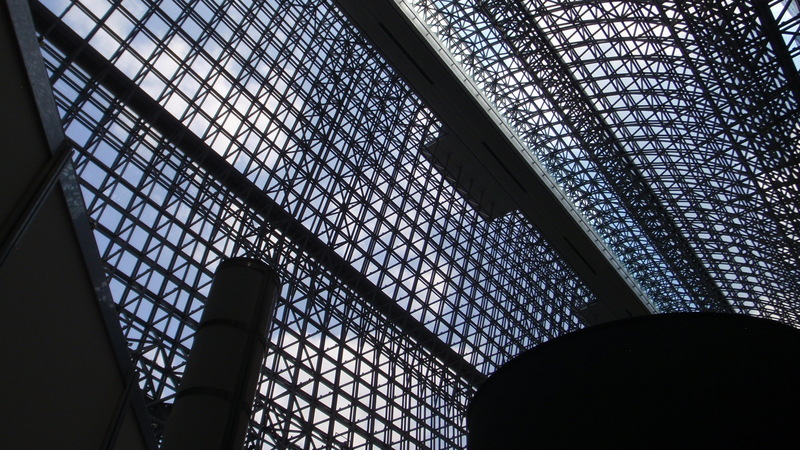 Kyoto Station was architecturally gorgeous, from the exposed steel structure inside, to the cubist repetition outside, and the enchanting stairway with LED lights that changed colors and patterns. We had lunch at a “we deep-fry everything here” teriyaki restaurant inside the city-like station before checking in at the APA Hotel Kyotoeki-Horikawadori around the corner and down the block from the other APA hotel. 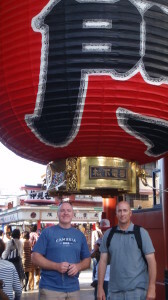 After a two-hour rest, we met in the lobby for our first night out in Kyoto and made our way to Gion. This very old and historic part of Kyoto still has Geisha, and we saw a few on their way to engagements. Although I’ve never been to Paris, I think Gion at night might have that same feeling of history and beauty with soft lights and a gentle breeze as we walked the old cobblestone streets. 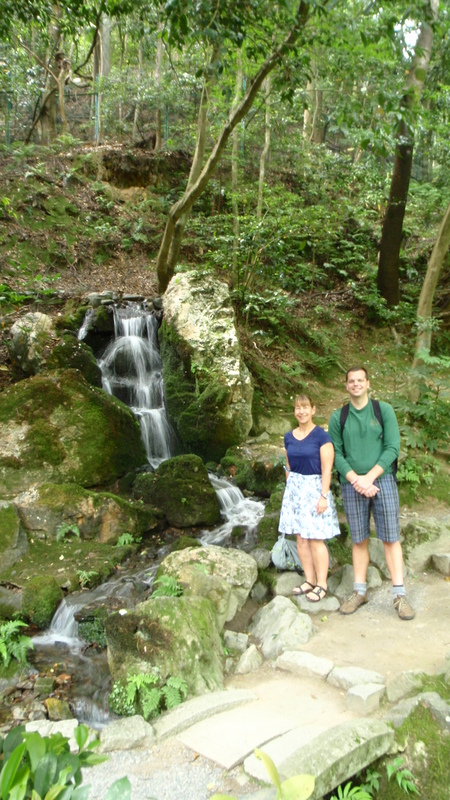 We started the day with an early cab ride to the Nanzen-Ji temple, maybe a 10-mile drive from our hotel. 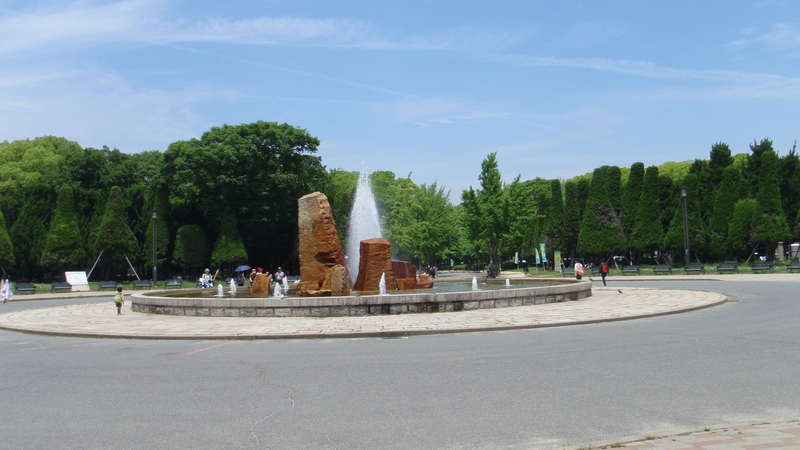 It was quiet and peaceful when we arrived, as the throngs of visitors wouldn’t arrive for another hour or two. 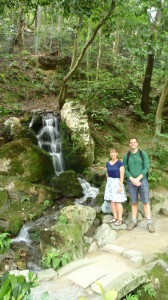 We walked through the garden areas and ancient aqueducts (still operational) and made our way out the gate to begin the Philosopher’s Walk (哲学の道, Tetsugaku no michi) to the Silver Pavilion and Kiyomizudera (清水寺, Pure Water Temple). 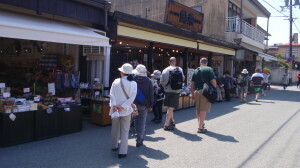 The approach to Kiyomizudera followed the steep, narrow lane of the Higashiyama District. The street was teeming with people but foot traffic flowed remarkably well as shoppers wove in and out of the stores that lined the street. 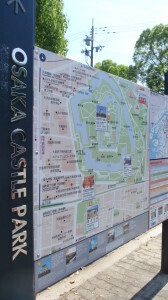 Along the way, many in our group were politely stopped by groups of school kids practicing their English. They’d ask a few fun questions (one of mine was “who’s your favorite anime?” My answer: Totoro! 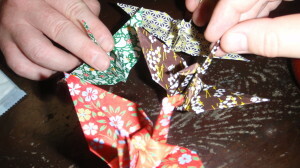 ), write down the answers, and sometimes offer a small gift of origami or other keepsake. I got a request for a photo with these great kids, and I cherish it. 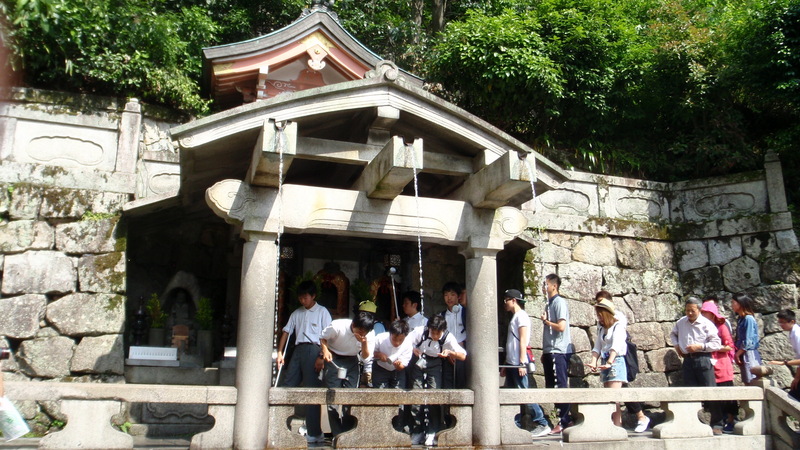 The Otowa Waterfall at the base of the Kiyomizudera temple’s massive main hall is a magnet for visitors. 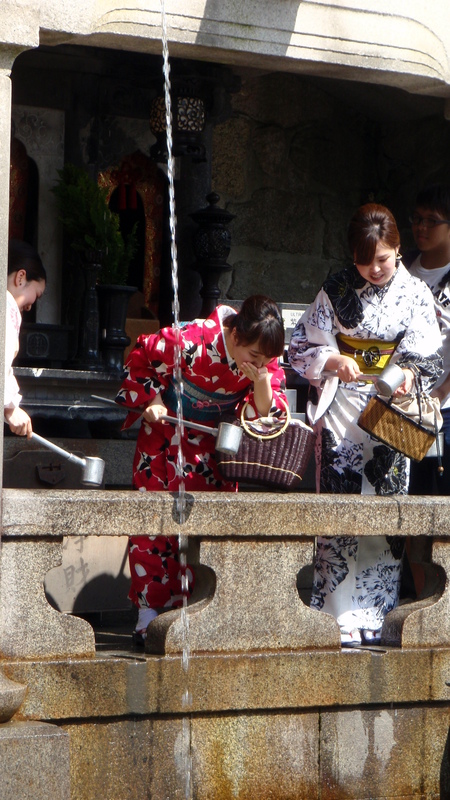 The waters are divided into three streams from which visitors can drink via cups attached to long poles. 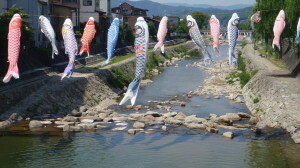 One website said the streams have different benefits – longevity, success at school, and a fortunate love life. However, as the article instructed, it’s considered greedy to drink from all three streams! We hit breakfast at Mister Donut in Kyoto Station before getting the train for our day trip to Osaka. Our first stop in Osaka was Osaka Jo Koen, the Osaka Castle and Park. 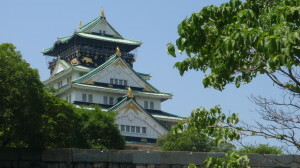 The tour of Osaka castle took us up eight floors and through a chronology of the history of the castle and the 400th anniversary of the clash between the Toyotomi and Tokugawa clans. 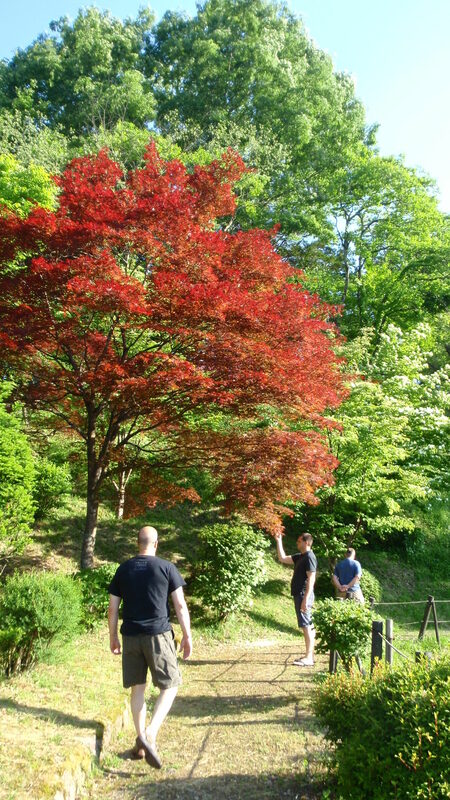 After the tour, we explored the grounds and found a Shudokan, a martial arts hall with classes in Kendo, Judo, and Naginata. 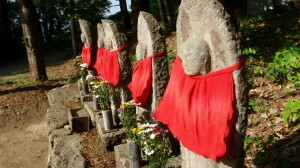 We also walked by a Kyūdōjō, where a few women were outside with their bows in long cases waiting for class. 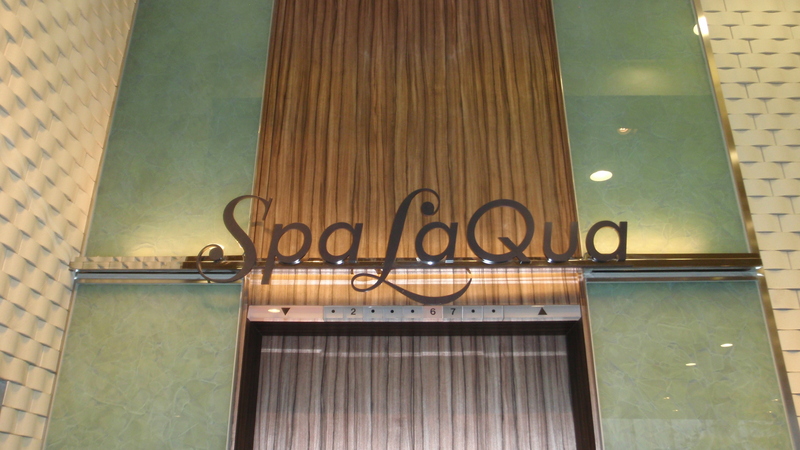 From there, we took a local train to the Q’s Mall in Osaka for a little shopping (super cool shirt shop and Ninja stores right next door to each other) and then Spa World – a multi-storied hot bath extravaganza! The men’s and women’s floors change every month or so, and for this visit, the woman’s floor had at least eight bath areas: Rome, Greece, Finland, Italy, Mediterranean (outside with a cool waterfall), salt sauna, herbal baths, and geranium foot soak. After an hour and a half, we met in the common area and let the Doctor Fish have a go at our travel-weary feet. 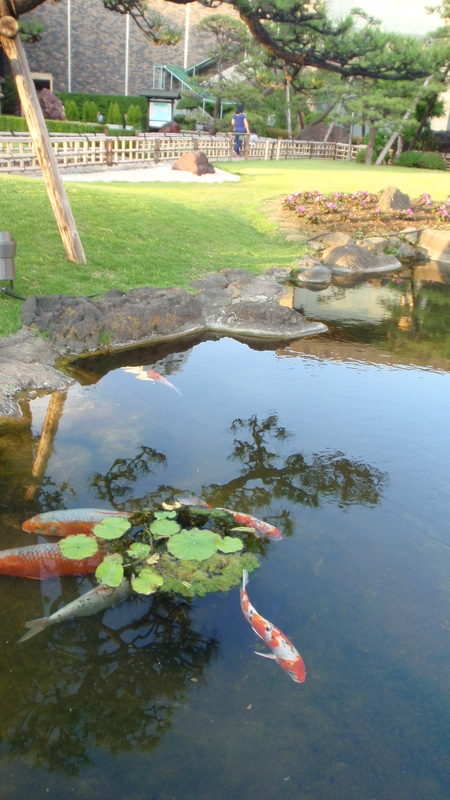 We then headed up to the top floor and the family area with a lazy river (perfect for a Brazilian Koshi Nage – arigatou, Les-san!) and a huge hot tub, where we sat and talked before ending our Spa World experience. 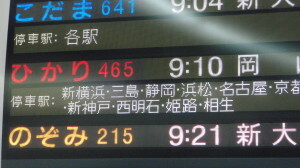 On the Shinkansen back to Kyoto, the train was delayed again. Another earthquake. This one was about 8.5 magnitude, located offshore luckily, so it did no damage. 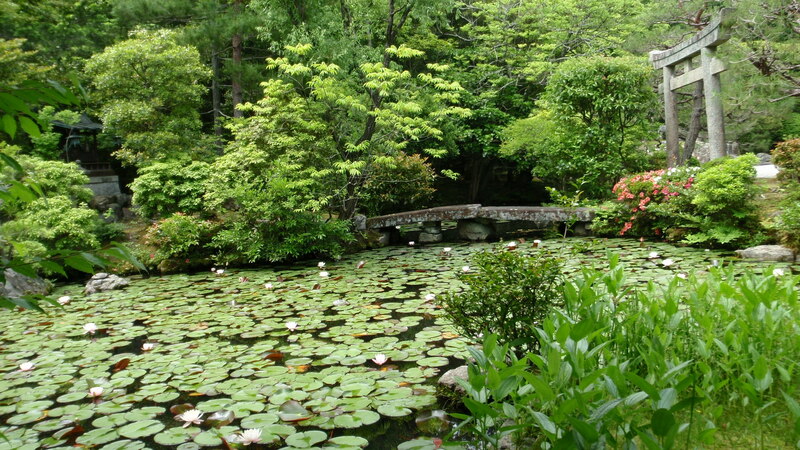 Before we boarded the train from Kyoto back to Tokyo, we took a cab to Shousei En Garden, a lovely place where we spent an hour quietly walking around. 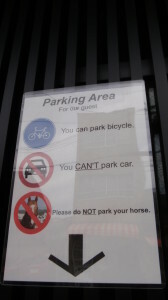 On the way, I spotted this instructional parking sign. On the train to Tokyo, Blevins Sensei pointed out the window on the side of the train where I was sitting and said to keep an eye open. Mount Fuji would be on that side and it might be a clear enough day to see it. 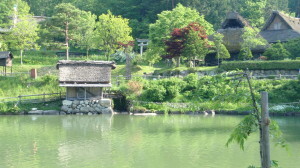 Next to me was a Japanese woman a few years older than me. 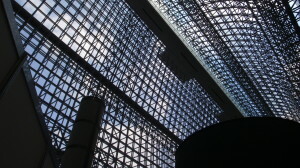 We said hello and I started reading another chapter of “Wild” as I glanced up now and then in hopes of seeing Fuji-san. 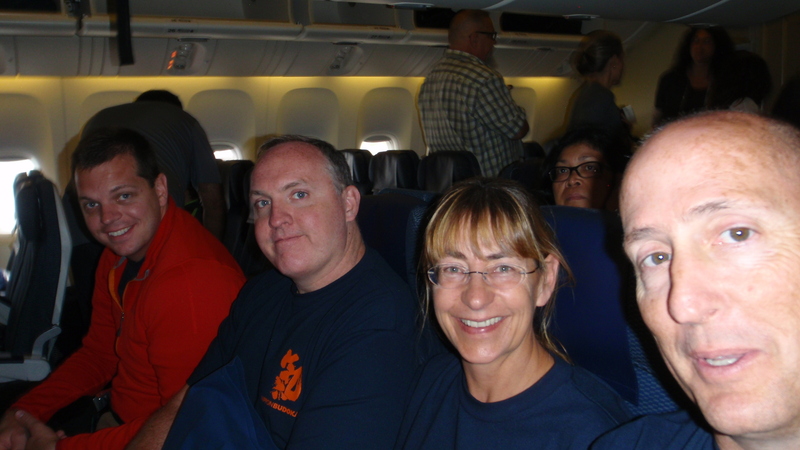 I dozed off, and my seat mate tapped me excitedly on the shoulder. “If we could see Fuji-san, it would be right there, out the window! But we can’t see it today! But if we could, it would be RIGHT THERE!” She was so excited, and of course all of this was in Japanese, and I was excited that I understood what she was saying! 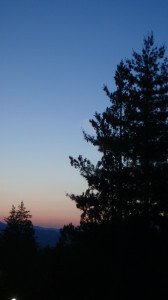 I shared her excitement, and disappointment, at not being able to see the revered mountain today. We started talking about where we both were going, and she asked where we been and what we had seen. 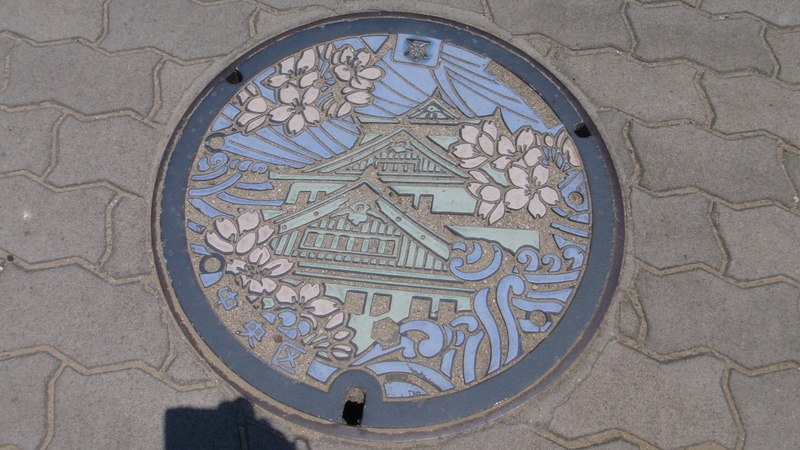 I shared about Tokyo and the Budokan, and our trip to Takayama, Kyoto, and Osaka, and now back to Tokyo. She said, wow, we’d seen a lot of the country! I asked if she’d ever climbed Mount Fuji. Oh, no no no, she said. Too much for her, but she thought it was beautiful. 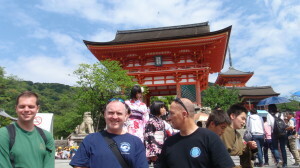 This – my first real (albeit simple) conversation with a Japanese person – was great fun and a great milestone. 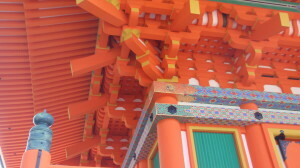 My very basic knowledge of Japanese was aided by several pantomimes and shared laughs at figuring out the right words, but I believe the bigger reason for the relative success of my first real conversation was my willingness to do my best, not worry about perfect grammar and vocabulary, and just go for it. Hmm. 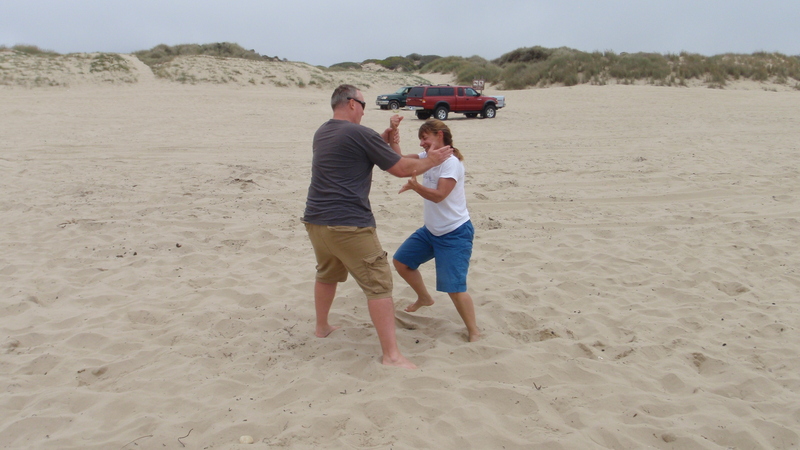 It’s a lot like Aikido. After checking in to our hotel — Keio Presso Inn Higashi-Ginza — and a 20-minute break to leave our luggage, we were back in the lobby to go explore the intensely busy Harajuku and Shibuya areas, followed by dinner at the best ramen shop in Tokyo (discovered and shared by Izawa Sensei), and shopping at Kiddy Land and Oriental Bazaar, two great stores for gifts and souvenirs. After we got back to our hotel, we went out for a late second dinner to Sushizanmai, a 24-hour sushi place just a short walk from our hotel. The beauty of Ginza is its proximity to Tsukiji, the world’s business fish market, so great and abundant and reasonably priced sushi was everywhere. Next door to the hotel was a neat pottery shop, and I stopped in as soon as it opened before the rest of the group met for breakfast in the hotel. There, and only there, did I find a blown glass sake decanter to match the cups I found Takayama. Coincidence? I don’t think so. 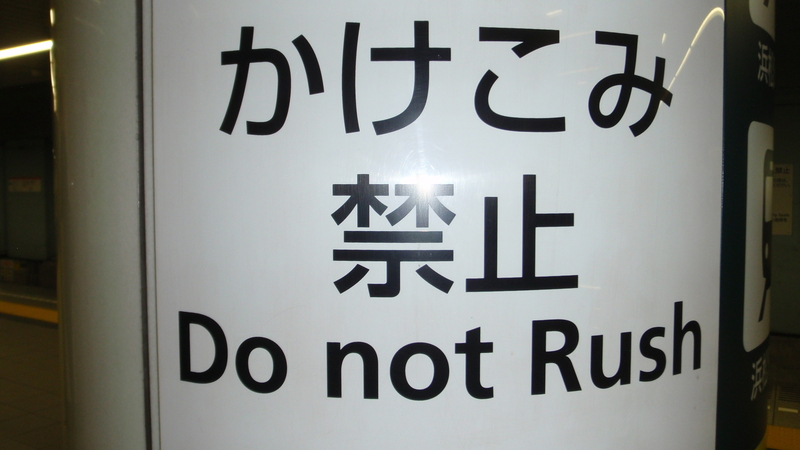 In the many train stations we were in, we frequently saw signs cautioning not to rush to board the train, as doing so could cause injury, perhaps death. For me, it was a good reminder of Aikido training, and echoed a phrase that Les-san uses a lot in class: “Be quick, but don’t hurry.” Actually, I think it’s good advice for any endeavor. 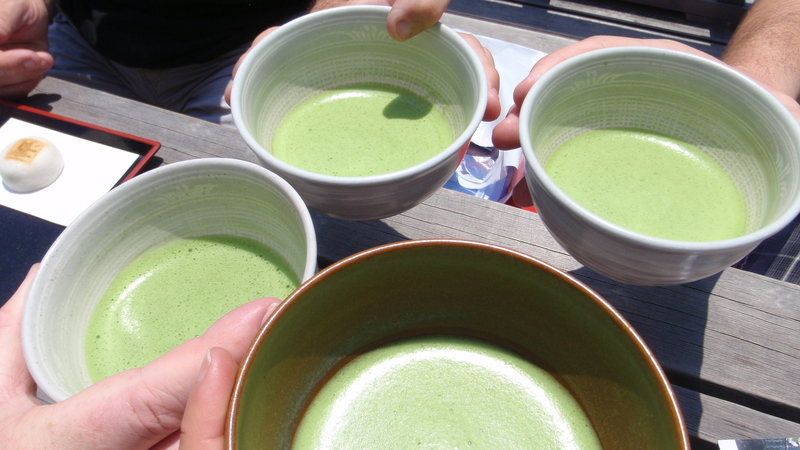 After a quick breakfast at the hotel, we headed to Asakusa for a little more shopping before taking the Sumida River cruise, which ends at the Hama-Rikyu Gardens and tea house, where we had a nice cup of matcha sitting outside. Next on the day’s agenda was a visit to Seido, the martial arts supply store. 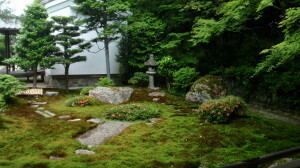 Blevins Sensei had called earlier to inquire about visiting, and the employee said, “It’s little confusing. You might want to take a cab.” A couple hours, several local train connections, and a cab ride later, we arrived at Seido, a little store packed with keiko gi of different fabrics, hakamas, weapons, obis, and gear bags. 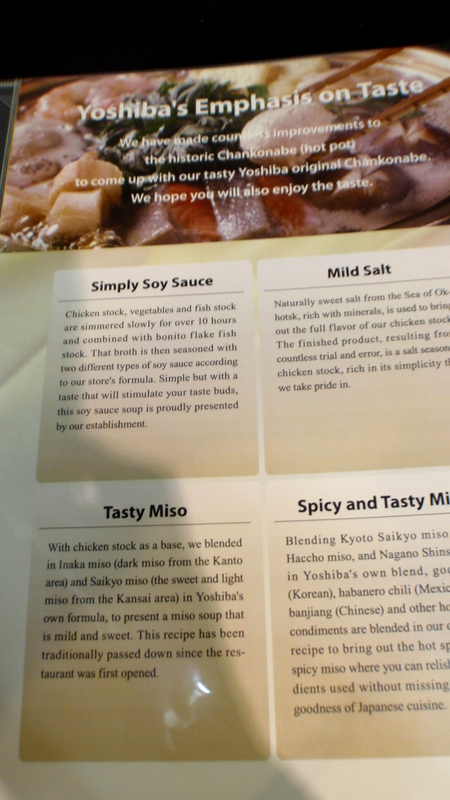 We all bought something and left happy with our Seido packages tucked under our arms. 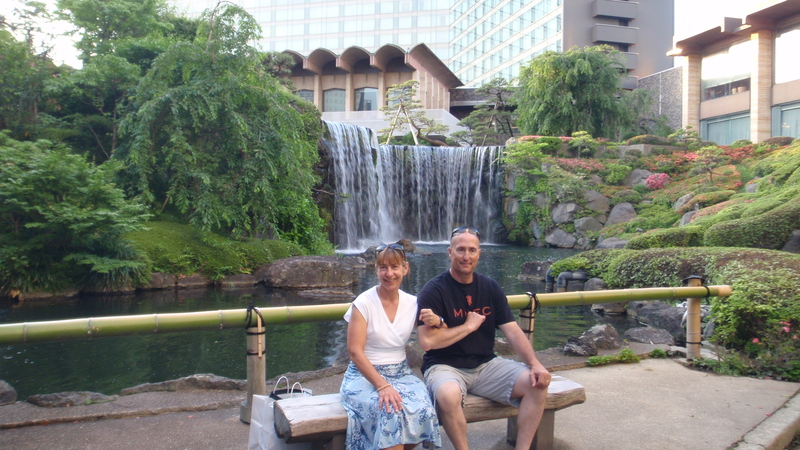 On the way back, we stopped at the remarkable New Otani Hotel and its amazing garden. The garden dates back over 400 years, when samurai lord Kato Kiyomasa owned one of his residences on this site. 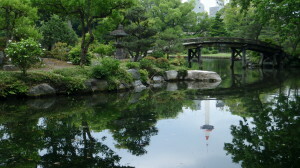 It was a tranquil counterpoint to the bustle of Tokyo, which lay just below and outside the gardens. 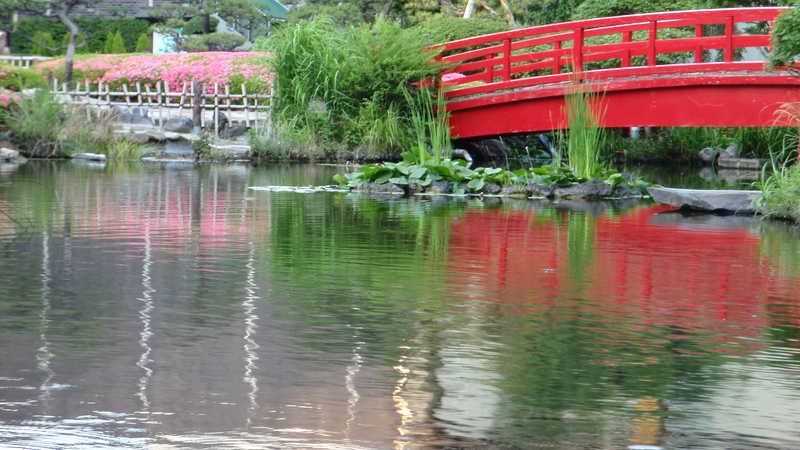 From there, we made our way toward our last dinner in Japan. The same restaurant where we had Shabu Shabu when we arrived in Tokyo was also known for its traditional Sukiyaki with a raw pasteurized egg. 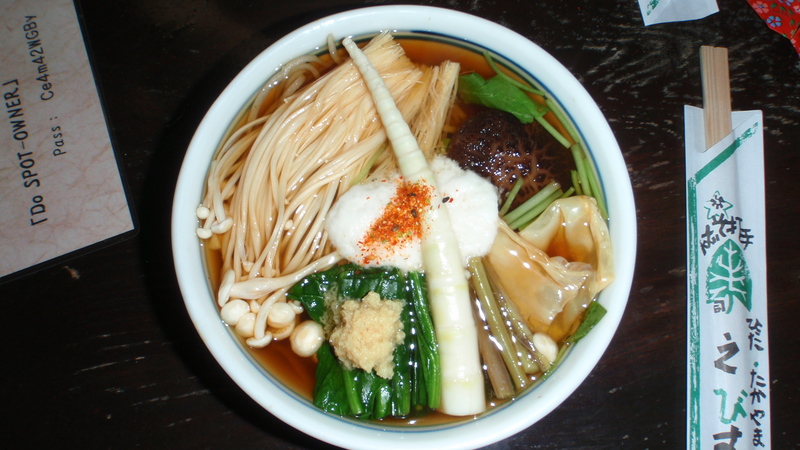 Prepared similarly to Shabu Shabu with a simmering pot of liquid, vegetables, and beef, it’s finishing up by adding udon noodles to the broth. 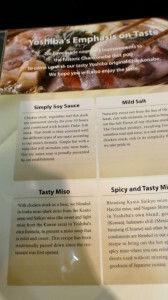 Les-san again showed his cooking prowess, much to the consternation and entertainment of our kind server. Back at the hotel, we sat in the lobby for a while, enjoying a final Kanpai with sake we’d brought from Takayama and watching sumo videos on YouTube. 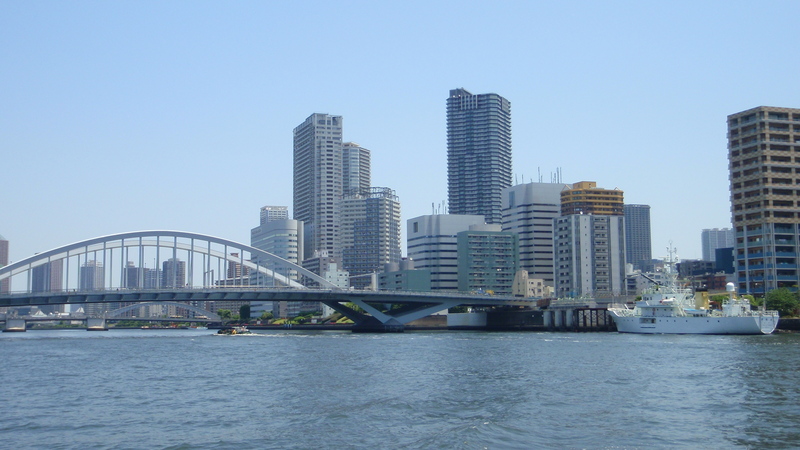 Our flight didn’t leave until 5:00 pm, which gave us time to take in the sights of Tsukiji and a little more sightseeing around Ginza. 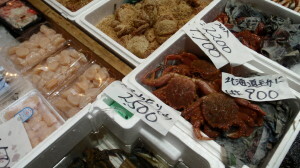 We arrived at the inner workings of the fish market well after the day’s sales were finished, but while it was “after hours” at Tsukiji, it was still very busy. 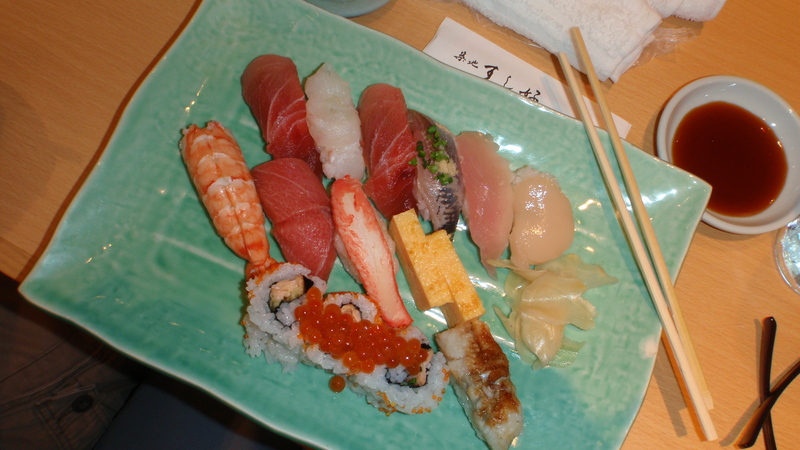 After dodging propane-powered carts and peering in bin after bin holding nearly countless varieties of seafood, we had lunch — sushi, of course! We passed the historic Kabuki theater and other Ginza sights before getting our bags at the hotel and taking a cab to the Shinagawa JR station. 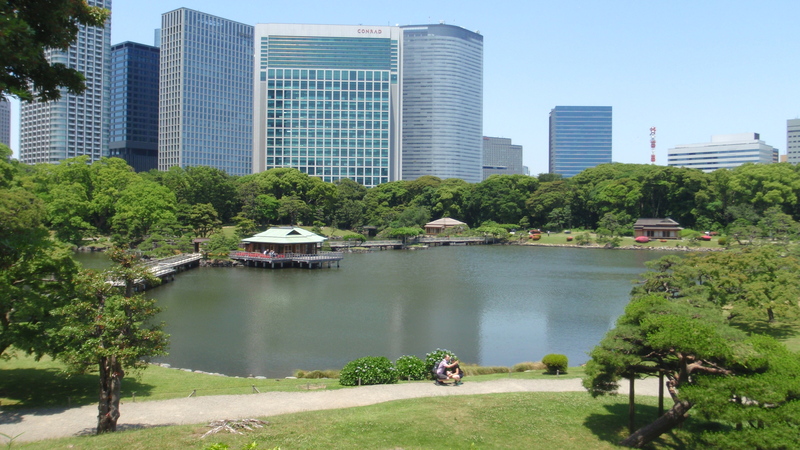 From there, the Narita Express deposited us at Terminal 1 at Narita International Airport, and we made an easy pass through security and exchanged money from Yen to USD. 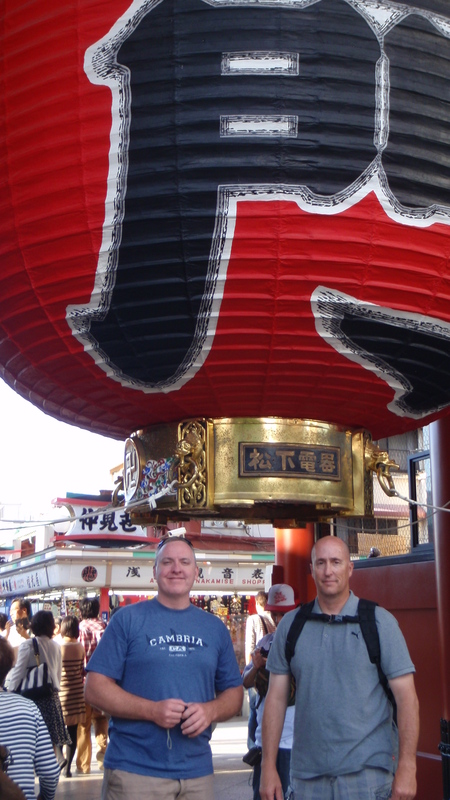 Twelve or so hours and two or so movies later, we touched down in LAX, our Japan 2015 trip complete and successful in every way. 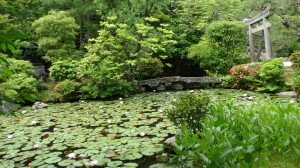 I will forever remember the lights above me while standing on the floor of the Budokan waiting for our demo to begin; seeing Iwama with my amazing teacher, Blevins Sensei, my wonderful Sempai, Les-san, and student John-san; my short conversation with the woman on the train; the serenity of the many gardens and temple grounds; training at Hombu, where the common language of Aikido is spoken by students from around the world; the charm of Takayama; the respectful energy of Tokyo, Osaka, and Kyoto. And mostly, I will remember the priceless time spent with dear friends and new acquaintances who share a passion for Aikido. Thanks, universe, for putting me on this path. 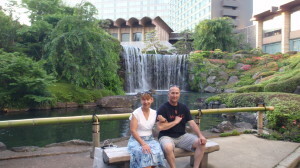 My thanks also to Nami Motomura at IACE Travel in Boston for her help in putting together the details of our itinerary. 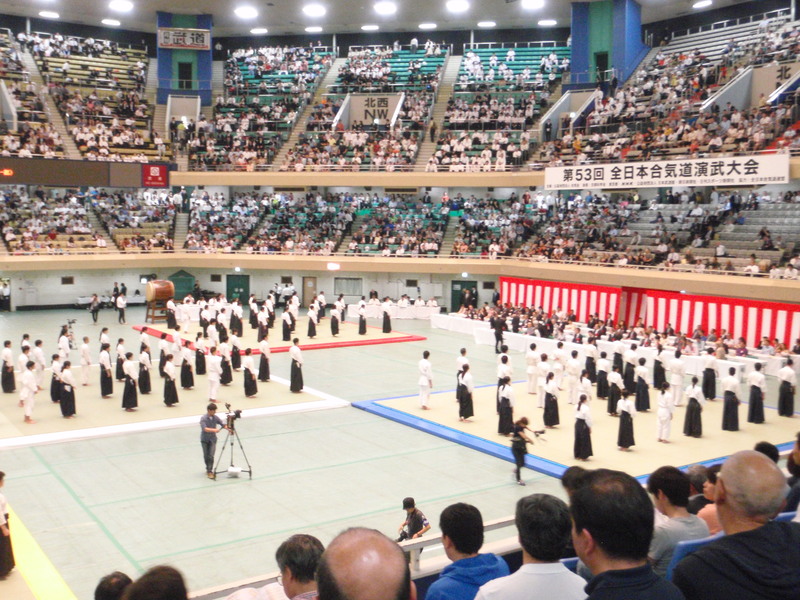 What’s octagonal, holds nearly 15,000 spectators, and showcases an annual springtime demonstration of more than 7,000 Aikidoka in 90-second displays of their dojo’s techniques and spirit? Tokyo’s Nippon Budokan (日本武道館), rising 140 feet high, was originally built for the 1964 Summer Olympics Judo competition. 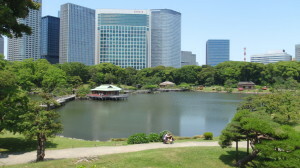 Located in Kitanomaru Park in the center of Tokyo, the Budokan is used primarily for competitions and demonstrations of several martial arts, including Judo, Kendo, Karate-do, Aikido, Kyūdō, Naginata, and Shorinji Kempo, as well as concerts and sporting events. Andrew Blevins Sensei and three of his students (Les Steveson, Kara Stewart, and John Purvis) had the great honor to participate in the 53rd All Japan Aikido Demonstration as part of Yasumasa Itoh Sensei’s demonstration with his dojo, Aikido Tekkojuku of Boston. Blevins Sensei was also a Nage in the demo, while Les-san and I were Ukes. 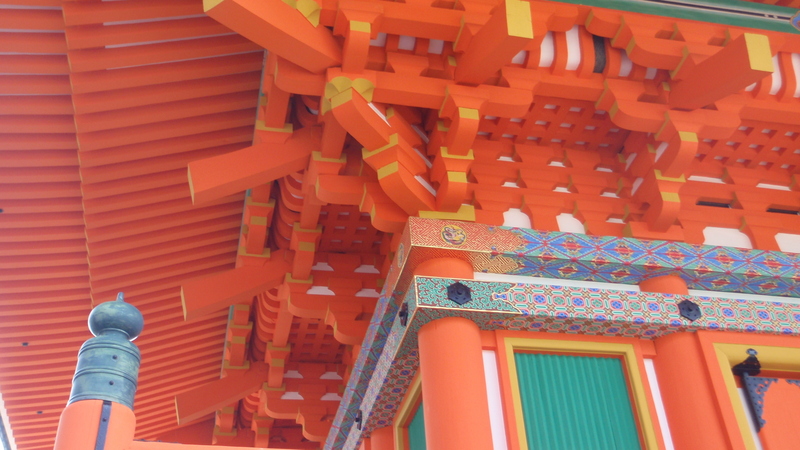 And that was just the beginning of an unforgettable two-week trip to Japan that took us from the bustle and bright lights of Tokyo to the quiet mountain town of Takayama and other places along the way. We arrived at Tokyo’s Narita airport at 5:00 pm on Thursday, May 21, and ran into Itoh Sensei’s group in the JR Rail Pass office. After handshakes and introductions, getting our JR rail passes and Suica card for non-JR trains, and taking the Narita Express Shinkansen (bullet train) into the city, we didn’t get settled into the Toyoko Inn in Shinagawa — our home for the next four days — until around 10:00 pm. Of course, we headed to a neighborhood izakaya (pub) to say Kanpai! and celebrate our arrival and all that lay ahead for the next two weeks. 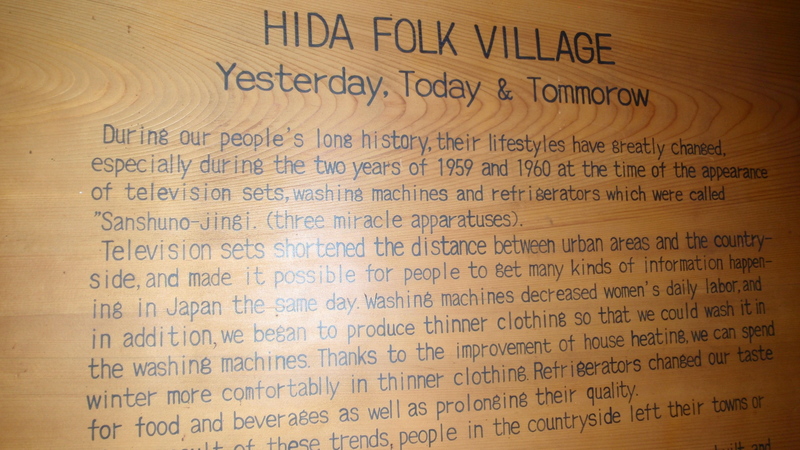 That meant quite a short night…because we would be attending Doshu’s 6:30 am class at Hombu the next morning. 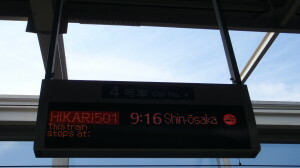 Being an hour’s train ride from Hombu, we met in the lobby at 5:00 sharp. There were probably 60 students on the mat for the morning class. I was excited to recognize some faces from when I trained there in 2011. 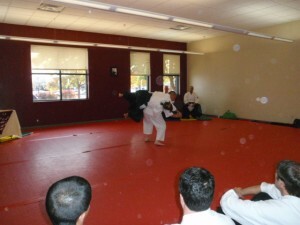 For the next hour, we practiced Shomen Uchi techniques, such as Ikkyo, Nikkyo, Sankyo, Irimi Nage, and Kotegaeshi. A different teacher taught the next class, and since there were fewer students on the mat, we could take falls and even did some more dynamic Ushiro Ryote Dori techniques. After the second class, Doshu very kindly allowed our group an hour to practice the demo together. While we’d all seen an animation of the order and flow of the demo, we hadn’t had a chance to all practice together. That opportunity really helped answer some questions and smooth out the demo overall. Our demo would be only 90 seconds from the opening strike of the taiko drum to the ending boom, and we clocked the demo in real-time at about 87 seconds. Perfect. 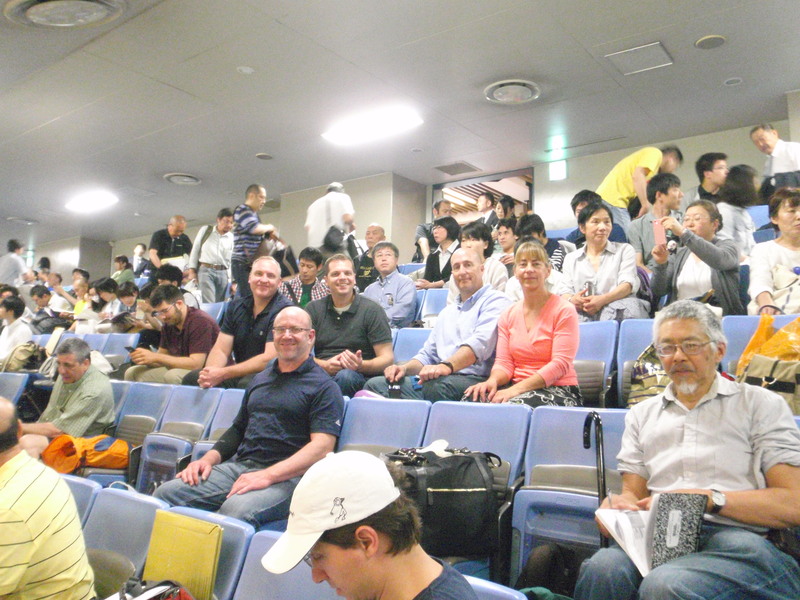 When everyone was changed, we headed over to the Budokan to get the lay of the land, take some pre-demo group photos, and talk one more time about logistics and planning for the next day. 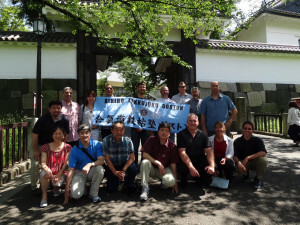 People had different plans for the afternoon, and our group plus Steve Norwood from Izawa Sensei’s Tanshinjuku dojo in Colorado, went to the Edo Tokyo Museum. It’s very well done — several floors of history, dioramas, and exhibits, and right next to the sumo training district, Ryōgoku (両国), with the sumo stadium, sumo stables, and chanko restaurants elbowing for space. The national sumo championships were that weekend and we tried to get tickets, but of course the events had been sold out for months. We consoled ourselves with a peek through the iron fence to see some sumo competitors taking pictures with their adoring fans. 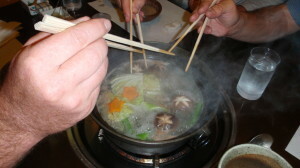 Dinner for us that night: Shabu Shabu (swish swish, which is the sound of rare beef being swirled through simmering broth and vegetables). 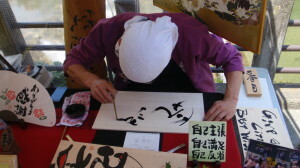 Les-san showed his natural talent with the required technique. I think he has great potential to be a Shabu Shabu king when he retires from his other job in a few years. This is it! Today, we’ll be joining more than 7,000 other Aikidoists from across Japan and around the world to participate in the joy and community that is Aikido. 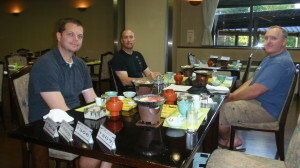 Because the doors of the Budokan don’t open until 10:00, many of us met for breakfast at the hotel before heading over. 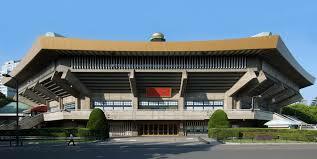 We arrived at the Budokan in good time, which meant we got to wait in line in the shade – nice. 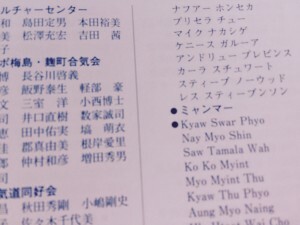 Itoh Sensei handed out the official program, and there it is: all our names in katakana under the アメリカ (America) header. In fact, we are the only group from the USA participating in the All Japan Aikido Demonstration, and only one of five non-Japanese groups. I feel everyone silently vowing to do our best to represent our country, but more importantly, to support Itoh Sensei in having a great demonstration. Itoh Sensei wanted us to get to the Budokan early so we could get good seats in the stands from which to watch the demos before and after ours. We settled in and prepared to take in the huge event for a couple hours before it was time to change into our gi’s and hakamas prior to our time slot. 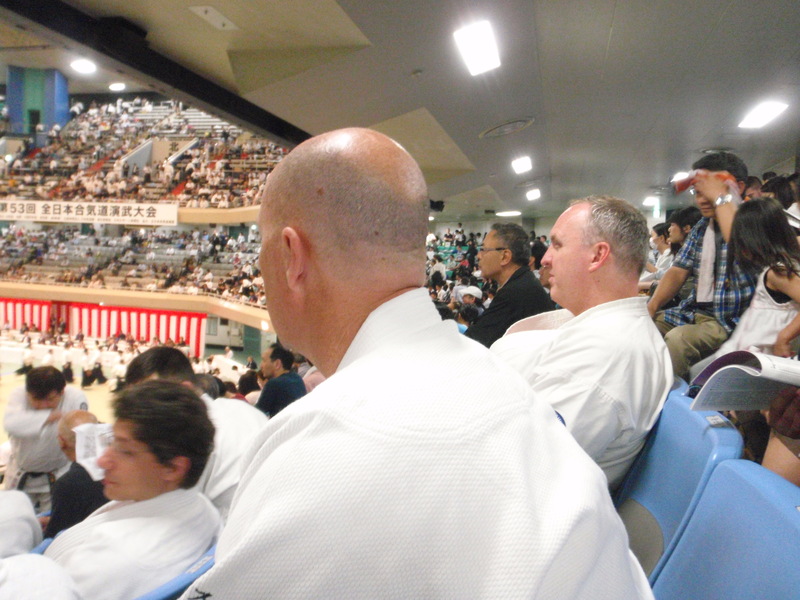 The stadium started filling up and it’s time for the 53rd All Japan Aikido Demonstration to begin! 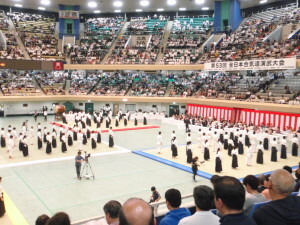 At the reverberation of the first taiko drum strike, five groups came quickly onto the color-coded mats and began their demos. Every 90 seconds, the drum sounded. Finished groups bowed out, new groups bowed in. Over and over the scene changed, yet there was both continuity and differentiation with every new set of demos. Finally it was time for our group to go change and then come back to our seats for a little longer before going to the holding area on the stadium floor to line up and wait. And finally, it’s really time. We head downstairs and line up. Last-minute instructions and directions shared among the team; our group surrounded by hundreds of other Aikidoists coming and going from their own demos. It’s loud, it’s chaotic yet controlled and organized. Are we nervous? I can only speak for myself, and perhaps speak of similar emotions held by Blevins Sensei and Les-san. 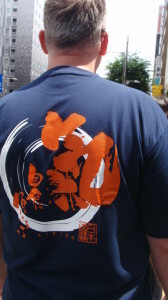 After all, we are of Kiryu Aikido. We are how we train, and Kiryu trains with focus and diligence and calm presence, training every class with martial spirit. Doing Aikido is what we do. The crowds don’t matter; they will fade away as soon as the taiko drum sounds. I’m focused, honored, humbled, and filled with gratitude, but I’m not nervous. As we walk onto the floor and wait on the sidelines, I look up at the thousands of lights in the octagonal ceiling. 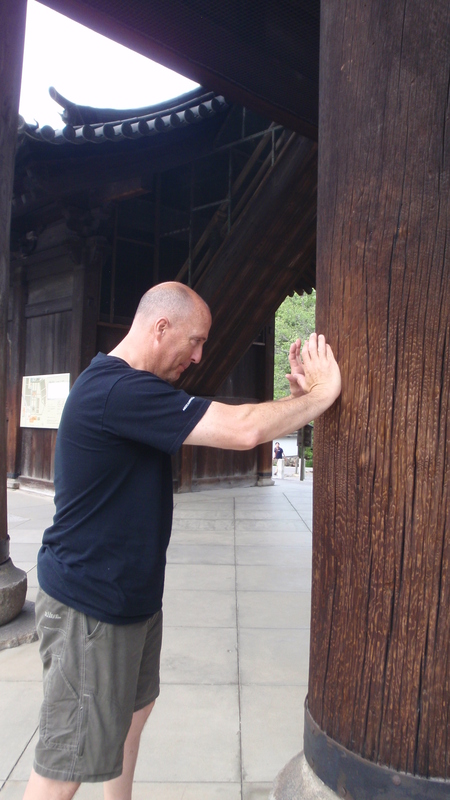 Just a few words whisper in my head: Thank you, life, for bringing me to Aikido. The taiko drum sounds and we trot onto the mat, quickly bow in seiza and begin. First, we all attack Itoh Sensei with Yokomen Uchi from the right hand. He throws all of us in different techniques, then Joji Sensei takes the center and throws three Ukes. Blevins Sensei is next and throws three Ukes: I’m his first Uke and Steve Norwood is his third. Les-san is thrown by Christian-san. 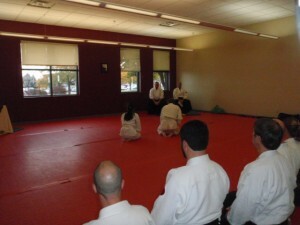 A few more throws by Itoh Sensei, and we all take our end positions and line up for our final bow from seiza. The drum sounds, and we exit the mat. How’d we do? 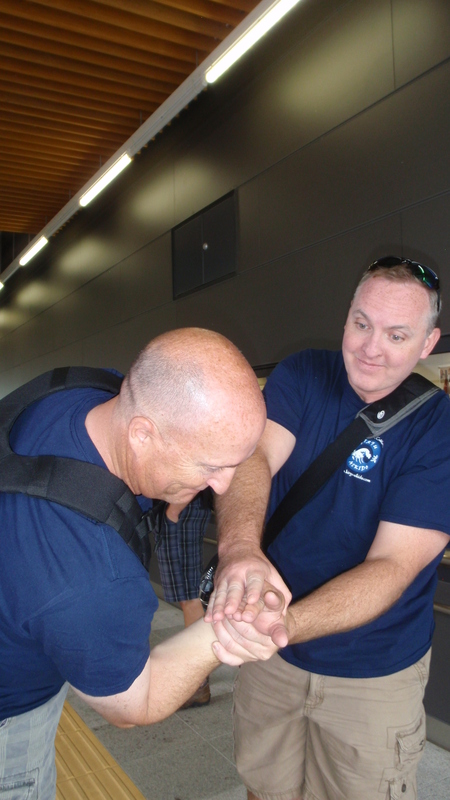 If the hugs, smiles, and back slaps were any indication, it went well. Itoh Sensei’s linear and angular structure of the demo was unique and very effective. 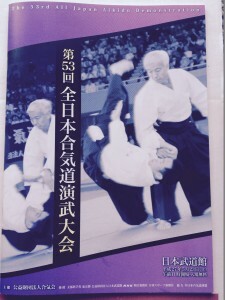 It showcased his years of devoted training with Kanai Shihan and his unmistakable techniques. 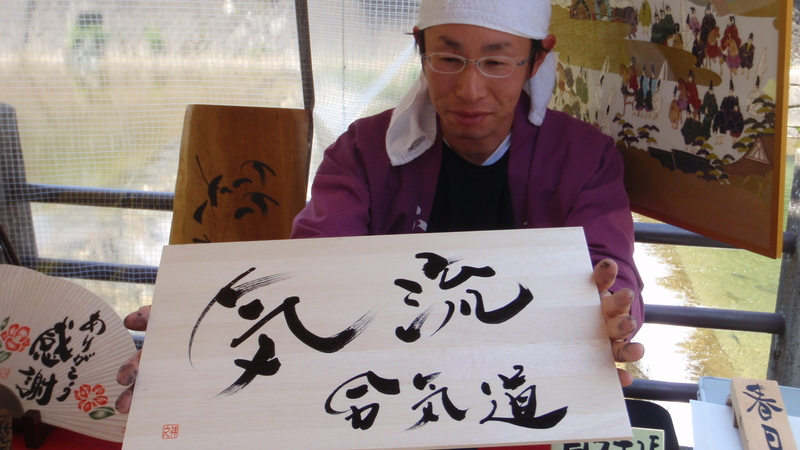 I believe the demo honored his teacher as we were hoping to honor Itoh Sensei by doing our best for him. 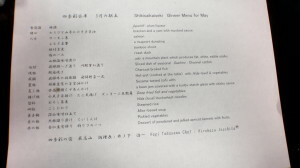 After the demo, Itoh Sensei’s good friend Shin Ikesue made dinner reservations for us all at a lovely Chinese restaurant for an after-demo celebration. Little did we know that Shin-san also paid for the entire dinner. 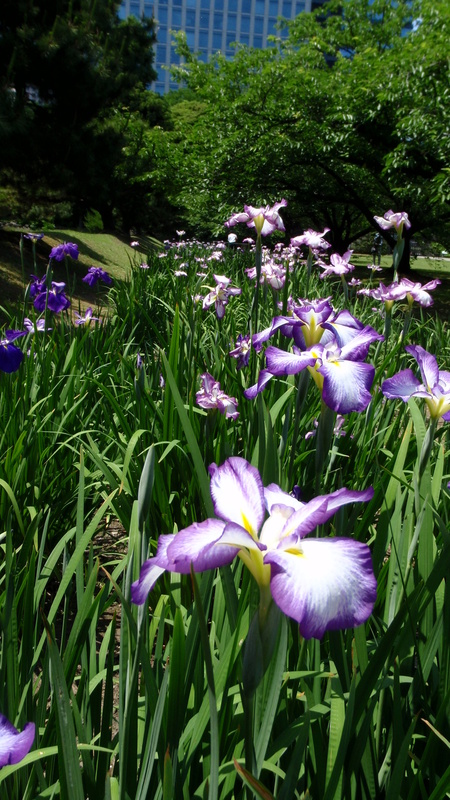 As Shin-san shared with me, Itoh Sensei was very kind and helpful to him earlier in his life. 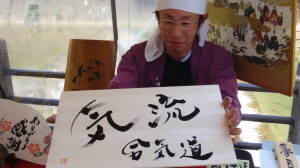 He will never forget that, and he wanted to honor Itoh Sensei through his kindness to all of us. We did not deserve it; his generosity was his expression of thanks to Itoh Sensei. It was a special evening, and the camaraderie of two dear friends was evident. It made me think of ways I can honor my dear friends by helping others as an expression of thanks for those who have helped me along the way of life. On the Sunday following the All Japan Aikido Demonstration, Doshu graciously teaches a free class for all who have been involved with the demo. While I thought Friday morning’s class was full, Sunday’s 10:30 class was packed. I estimated at least 100 people on the mat, which was great for even more spatial awareness and flow amidst other pairs. 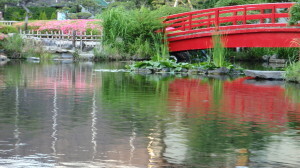 A few times, I had that sense of a still center surrounded by swirling energy. 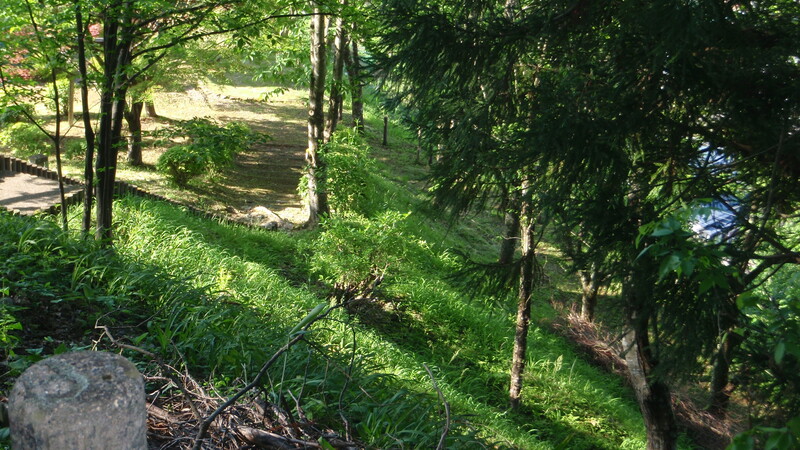 I can’t describe it in words, but the feeling was wonderful. 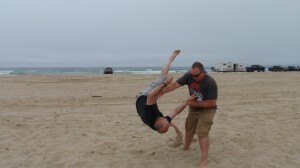 We practiced Katate dori techniques, including Ikkyo, Nikkyo, Irimi Nage, Shiho Nage, and even some hanmi handachi. 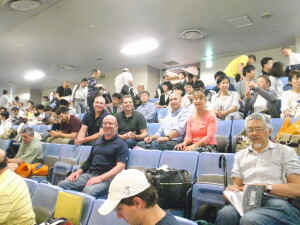 Class had a great energy and the pervasive feeling of joy in a shared experience at the Budokan. 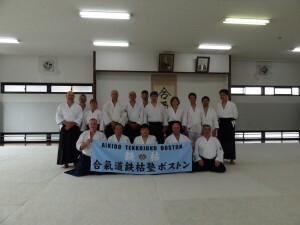 Kiryu Aikido sincerely thanks Kei Izawa Sensei and Tanshinjuku dojo of Colorado, www.aikitsj.com, and Yasumasa Itoh Sensei and Joji Sensei and students at Aikido Tekkojuku of Boston, www.aikidotjboston.org, for the opportunity to be part of this event and sharing experiences in Japan. We look forward to continuing to train and practice together, appreciative for the great dojo relationships and community we share. Beginning February 8, 2015, a Sunday afternoon class from 2:00 to 4:00 will replace the Saturday morning class. We welcome you to come learn Aikido in our strong, supportive, safe environment. This year, think about making a commitment to you, your personal growth and fitness, and how you blend with the flow of daily life. 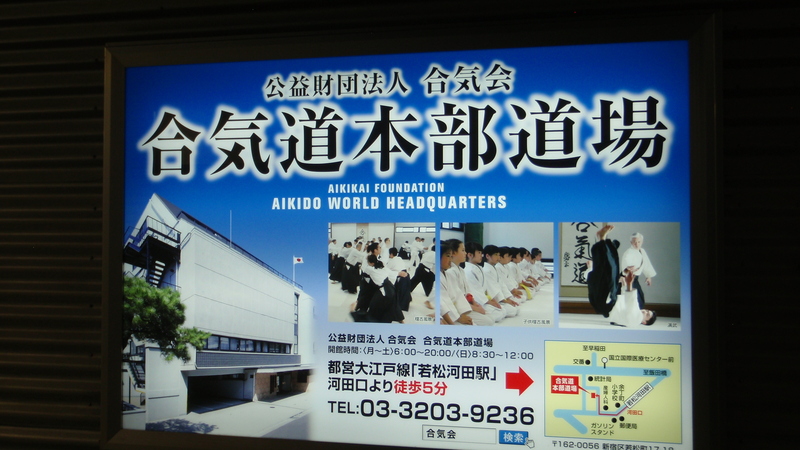 We encourage you try Aikido; it could change everything. 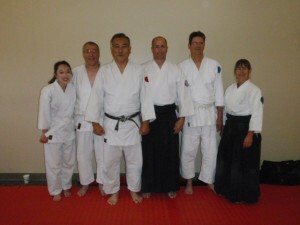 Kiryu Aikido with Izawa Sensei following the tests. This attempt at haiku, albeit poor, came to mind as I listened to bare feet swish across the mat while the first groups of earnest students performed their Aikido tests on a bright, breezy October day. Our biannual Aikido testing, again graciously hosted and overseen by Izawa Sensei and his Tanshinjuku dojo, was Sunday, October 26, 2014. 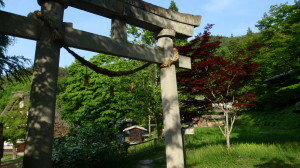 In addition to several students testing from Tanshinjuku and Doushinjuku, Kiryu Aikido had two students testing: Katie-san for Gokyu and Charles-san for Shodan. It was heartening (and not surprising) to see their strong tests — culmination of the hours they’ve devoted to practicing over the past few months. While the quantity of hours is important (it’s hard to improve without the sheer reality of time on the mat), I believe the quality of the hours is just as, or perhaps more, important. 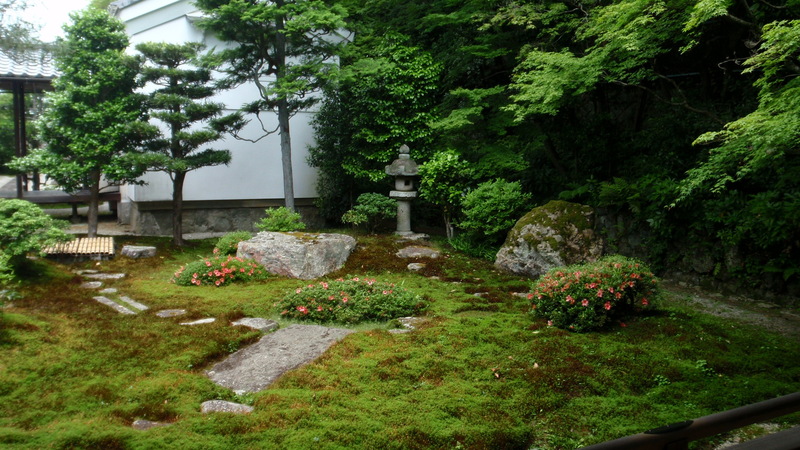 Without focus and the intent to push beyond comfort zones and plateaus, practice might not get us where we want to go on our Aikido journey. Katie-san and Charles-san showed diligence and dedication in their preparation leading up to the test day, and I believe their commitment to their practice was reflected in the quality of their tests. They were strong, clean, confident, with good spirit and zanshin. 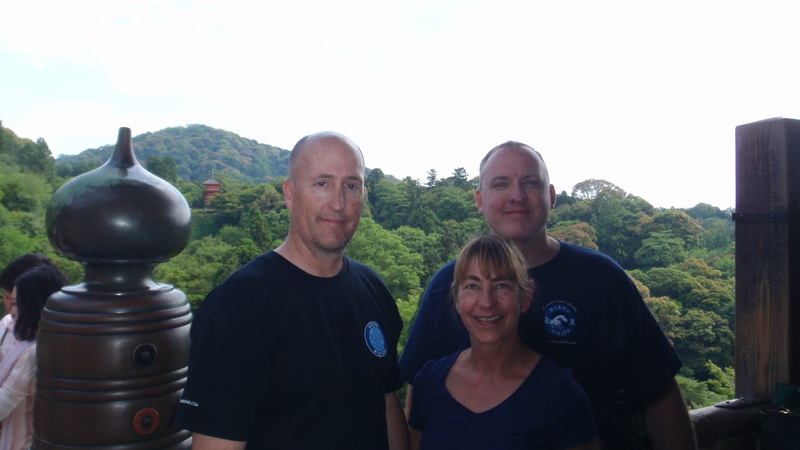 Thanks to our Ukes — Greg-san for Katie-san’s test, and Bob-san for Charles-san’s test — and to everyone in the dojo who helped them along the way every class. 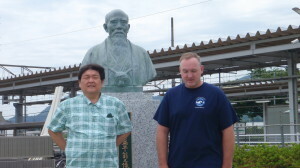 I want to personally thank Andrew Blevins Sensei and Senior Instructor Les Steveson for helping me prepare over the years so that I could have the honor of being an Uke for Charles-san’s test. Without you both, I would not have had the joy and privilege to be a part of his test. Congratulations, Katie-san and Charles-san. 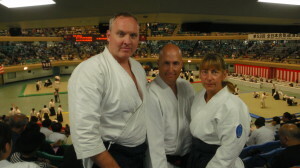 You did a great job, both in representing how far you’ve come on your Aikido journeys and in sharing the spirit of Kiryu Aikido, instilled into our dojo by Blevins Sensei, with others. Keep up the hard work, and see you back on the mat soon. 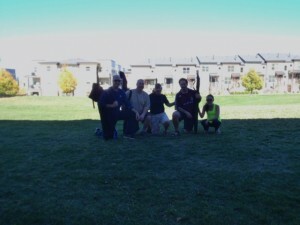 Les, Charles, Kara, Dave, and Katie wrap up a great Koen Club. 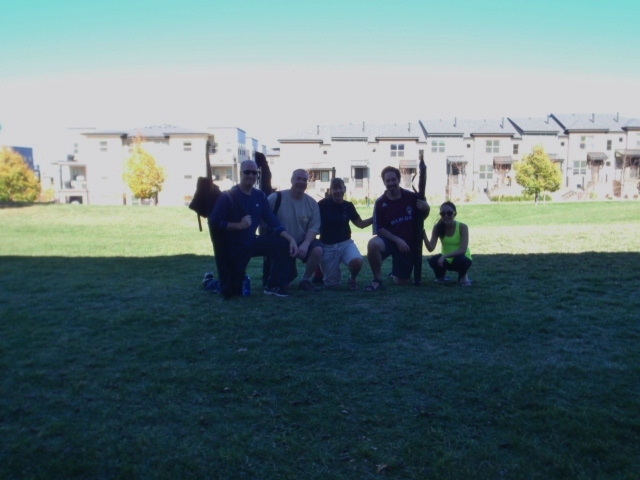 On Saturday, October 25, we met outside for two hours of Koen Club (park practice). After warming up with Tsuki No Bu of our 20 jo suburi, we moved on to paired practice. The second hour, we worked on ken suburi, including proper kamae and hand position, followed by awase practice with focus on martial intent of our strikes and proper maai. 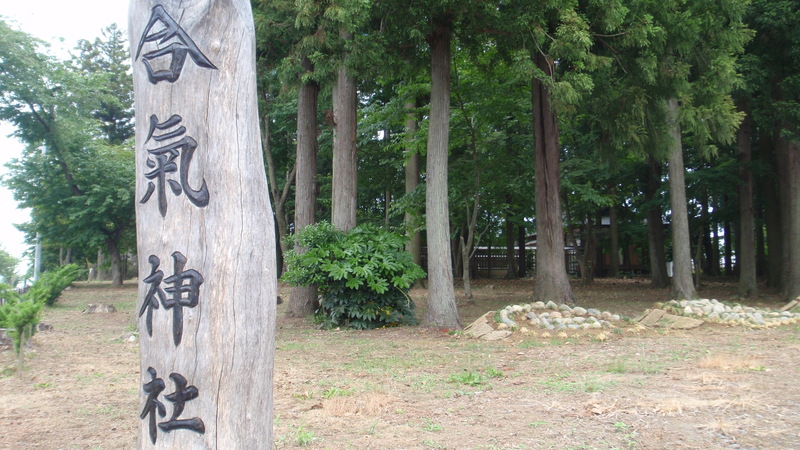 We ended with our first weapons relation: Ikkyo. Thanks, Les-san, for leading a great class and your emphasis on our spirit and effectiveness. What a great way to enjoy the warm late summer weather! The first part of July 2014, Kiryu Aikido Instructor Kara Stewart and I visited Andrew Blevins Sensei for a week at his home in Central California. While there, we trained and went over basic and intermediate weapons relations plus open hand techniques. Our first practice was in the backyard, against the backdrop of a lemon and orange tree. We started with a session on Tachi Dori, going through several techniques. It was great to pick up little tips and to brush off the dust a little. 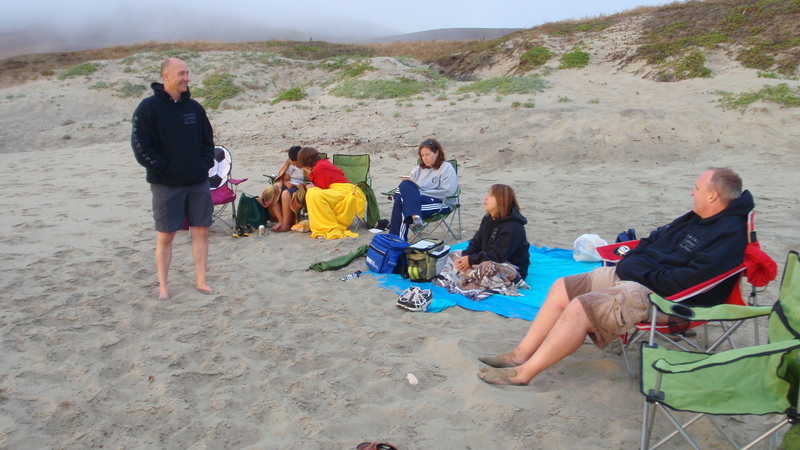 The next day of training was at Grover Beach, a very long stretch of beach that is a little over a mile from Sensei’s house. There, we worked in the sand – a great tool / reminder for keeping one’s center and balance, and moving well to keep up with the technique – and covered intermediate relations with the bokken. 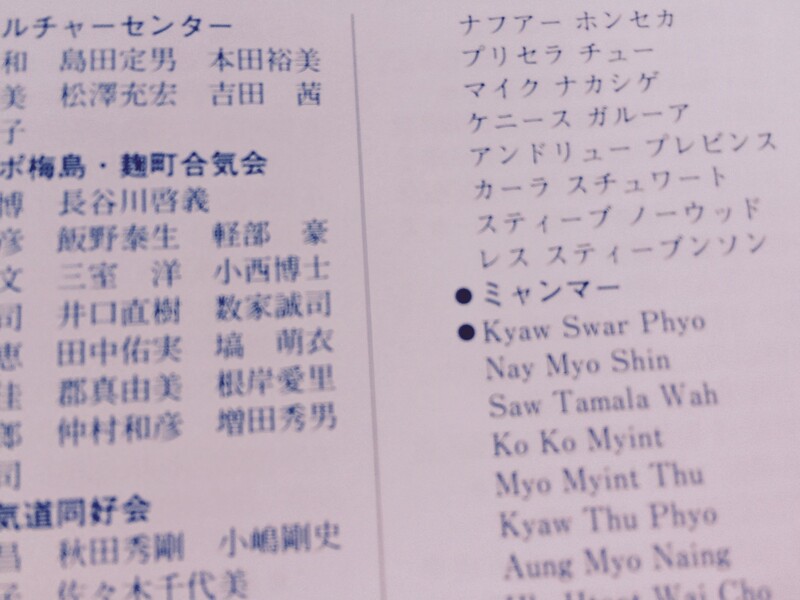 We worked on the Taijutsu with the relations as well. 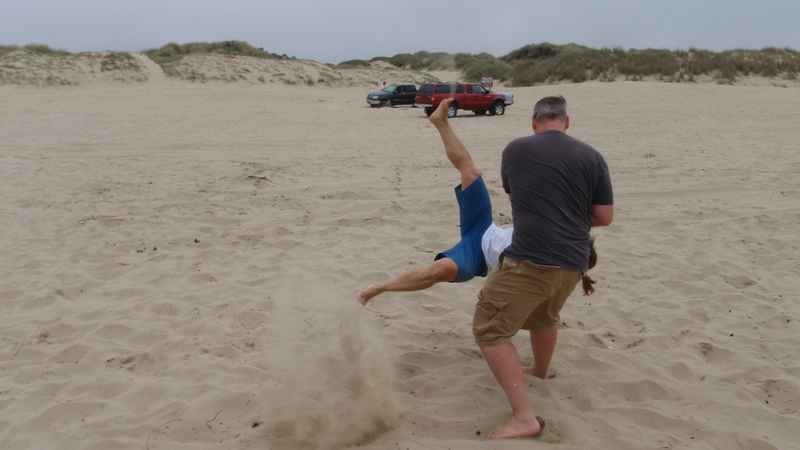 Then, we had the great fortune of taking breakfalls on the beach. Kara-san said it felt like landing on a memory foam mattress, firm at first, then the sand dissipated just a bit. 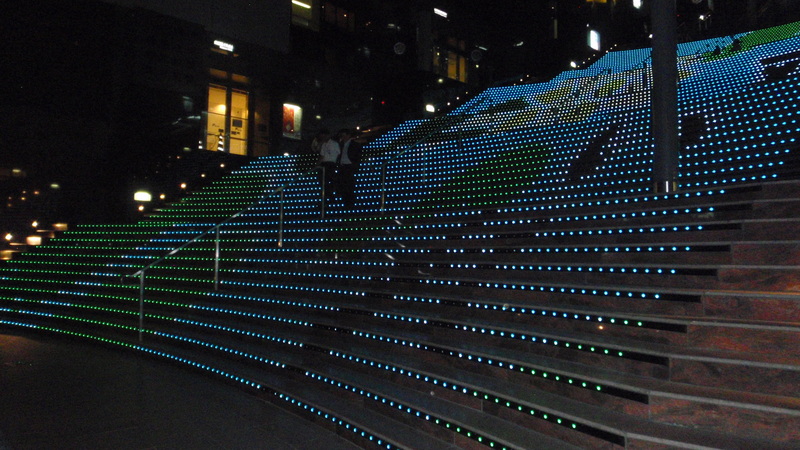 Really cool, and fun. The Aikido training was great, but visit was better. What a treat to see Sensei, Mina-san and Cyrus-san. This trip alone has made my summer very memorable for me and my family. We hope to see Sensei at the dojo soon. 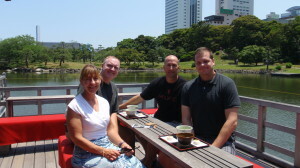 Kara-san and I appreciate all the time the Blevins family spent with us, and all the planning and wonderful outings and places they showed us. It was a priceless week. 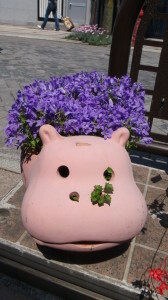 Arigatou gozaimashita! Just a reminder that every Saturday, the second hour of class is devoted to our weapons practice. 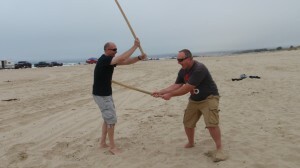 We’ll be practicing everything from the very important basic etiquette on to the suburi, katas, and relations. Don’t worry if you don’t have any weapons yet. 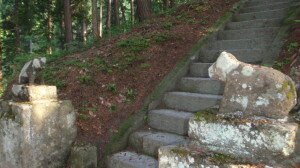 The dojo has a few sets for students to use. 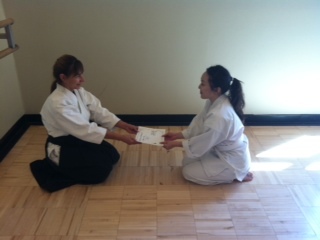 Instructor Kara Stewart presents Katie-san with 6th kyu certificate. Congratulations to Katie-san, who tested on Saturday, June 28, 2014, for her 6th kyu rank. Great job! You’re a wonderful example of dedication and positive attitude. Keep up the hard work. This journey is just beginning, and we are thrilled to be with you on this path.